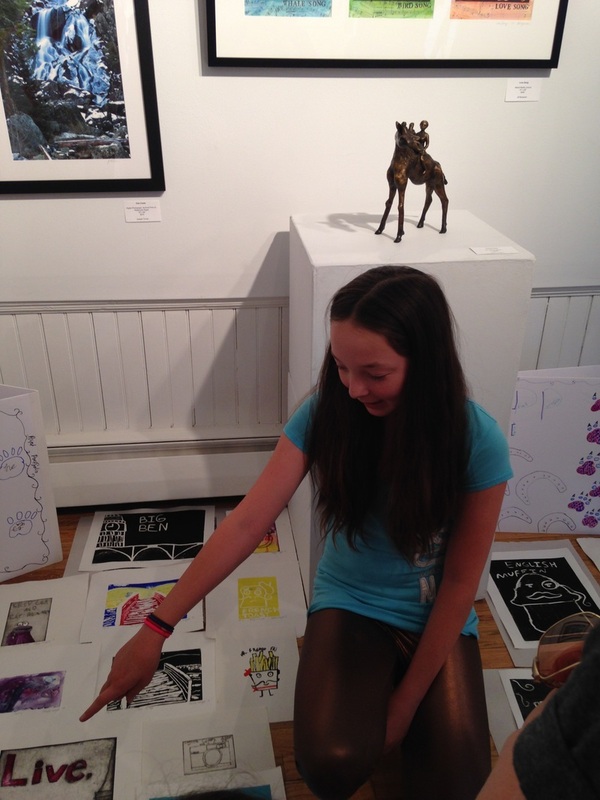 Young at Art Summer Printmaking Camp! 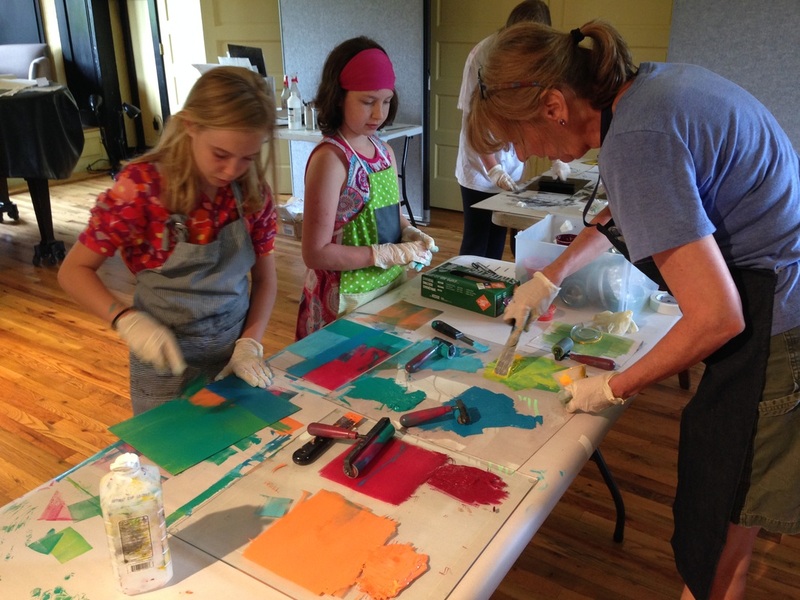 This summer Oehme Graphics held a printmaking camp at the Art Depot in Steamboat Springs. 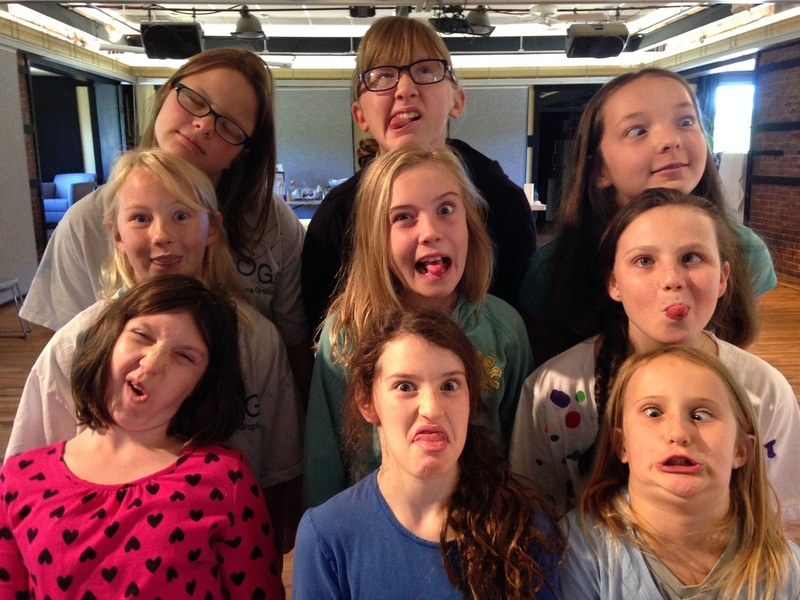 It was a busy week in which the campers learned many printmaking techniques and were able to produce a large portfolio of prints! 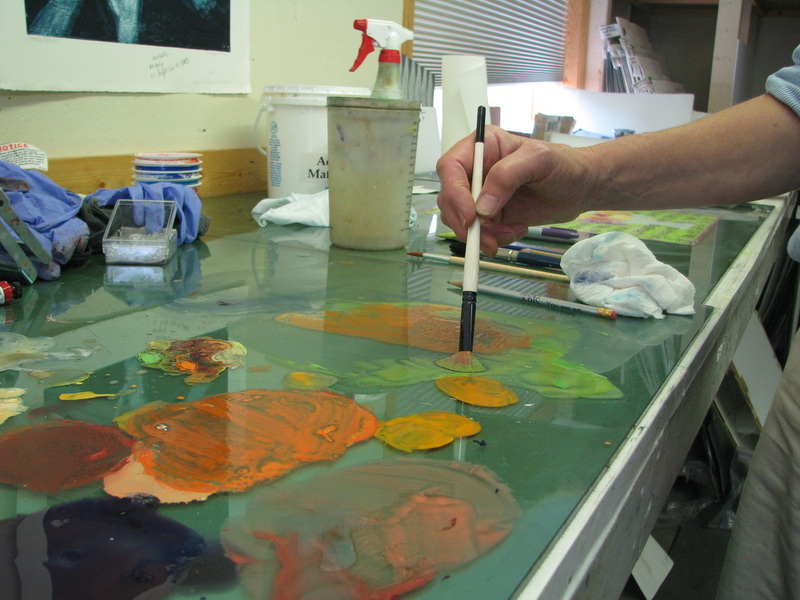 The week started with watercolor monotypes on vellum and drypoints on plexiglass plates. 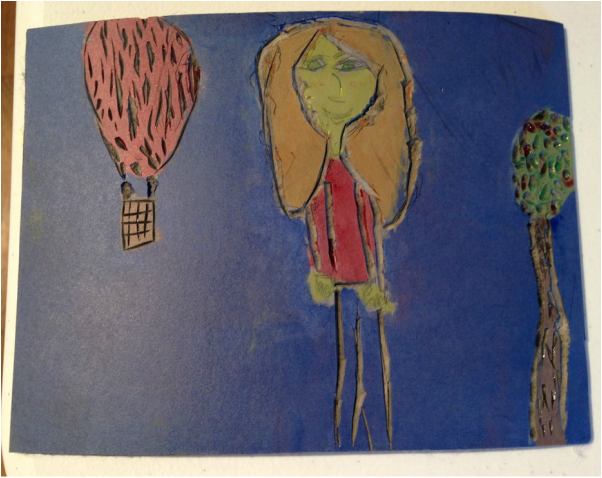 This first project introduced the students to the complexities of registering an image between two plates, as they had to line up their watercolors with their drypoints so that the images would correlate in the final print. 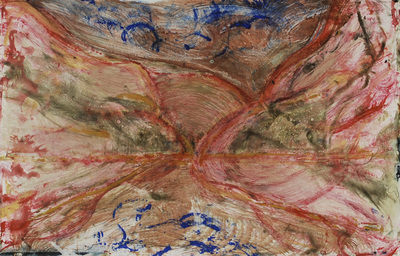 Here's one of the watercolor monotypes with drypoint. 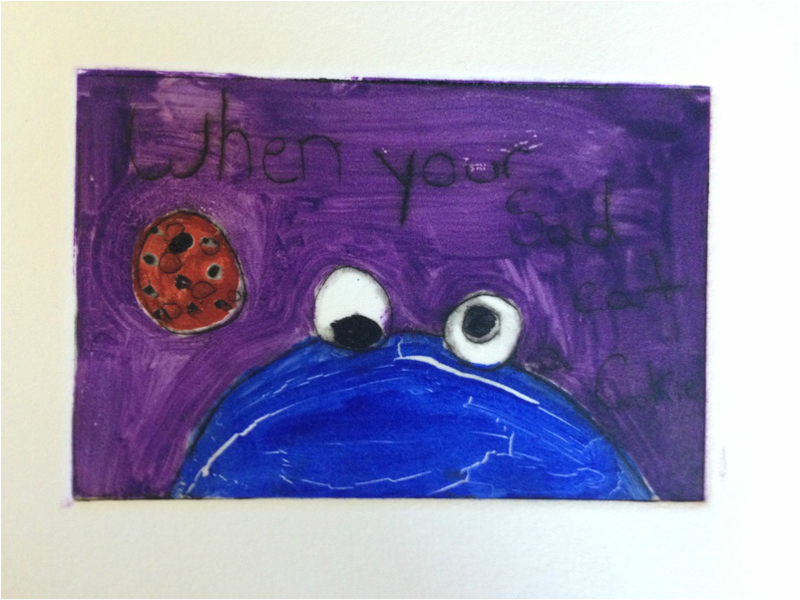 The cookie monster was a reoccurring theme throughout the week! 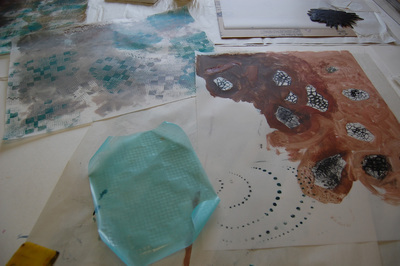 The second day we continued the monotypes and drypoints and began working on collograph plates. The campers had fun outside collecting leaves, sticks, and other natural findings to glue to the plates. Here is an inventive collograph plate that contains many elements from nature that were cut, altered, and glued down. This is the same plate after being flattened under the press and inked. Ready to print! Another fun technique we explored was relief rolling. 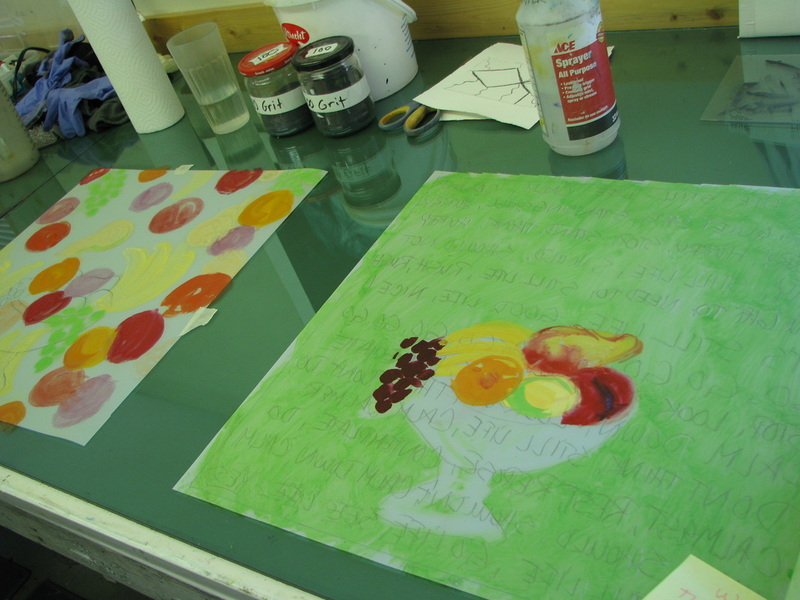 We rolled out many colorful inks and the campers each got their own plexiglass plate to roll the inks on as they liked. After rolling, campers used Q-tips, paper towels, and other experimental methods to draw by wiping away ink from the plate. A camper holds up her plexiglass plate. The backside faces us because when the ink on the other side is printed the writing will read in the right direction. 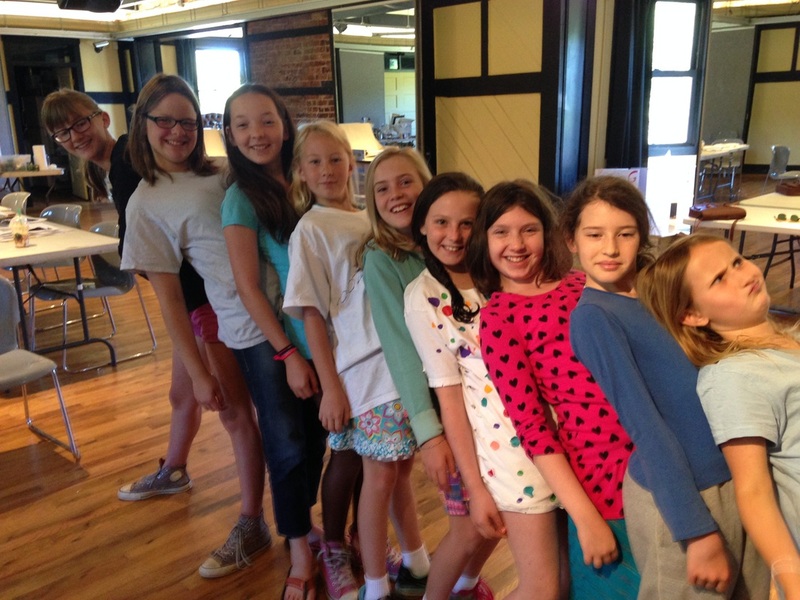 It seems that our campers are colorful printers as well as colorful dressers! 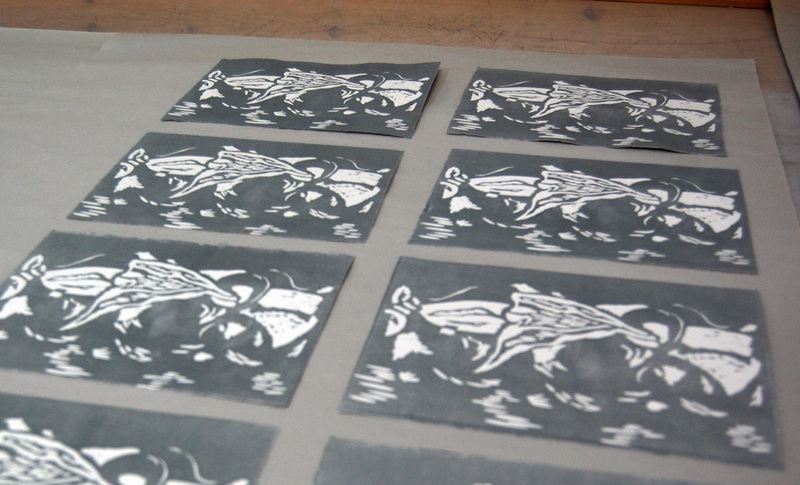 Our last two print processes were linocuts on linoleum blocks and etchings on copper plates. 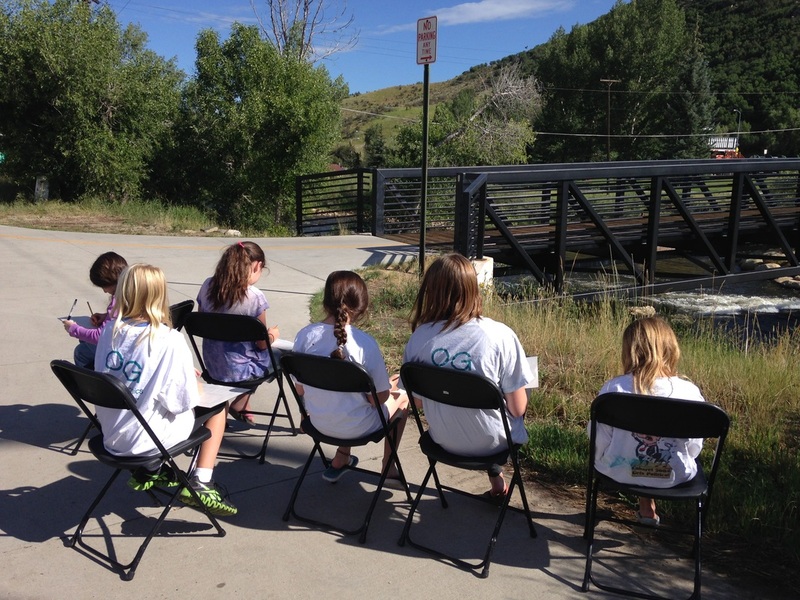 The campers drew inspiration from Steamboat by sketching the summer scenery surrounding the Art Depot. One of the scenes was a bridge over the nearby Yampa river. 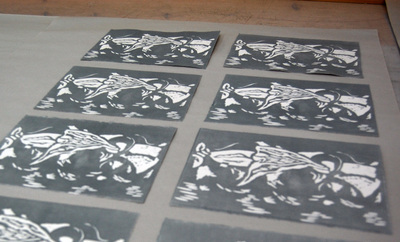 The linoleum blocks were carved away and relief rolled to create the final image. While the campers were carving, Oehme Graphics intern, Alex, read some folk tales from Native American folklore that captivated our campers' ears. 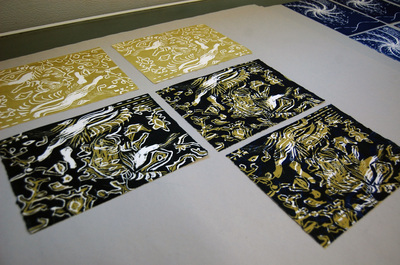 A finished linocut print with selective inking, which means that the colored ink is applied to specific areas as opposed to being rolled over the entire block. After the copper plates were covered in hard ground and drawn into by our campers, they were etched in a ferric chloride bath. 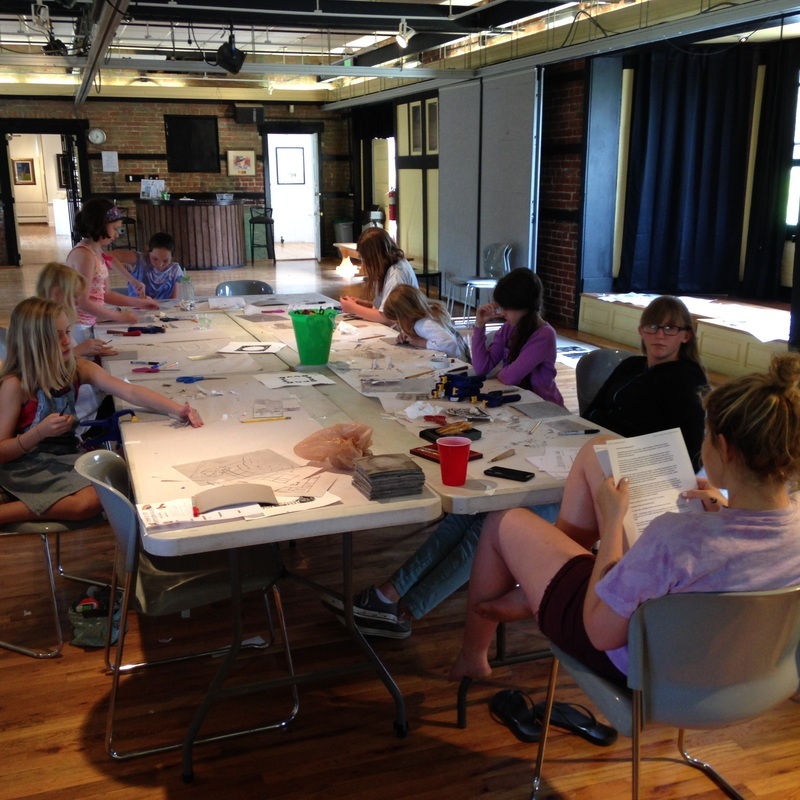 Friday was a busy day for all, as the campers took a field trip to the Oehme Graphics studio to see how the copper plates are etched. 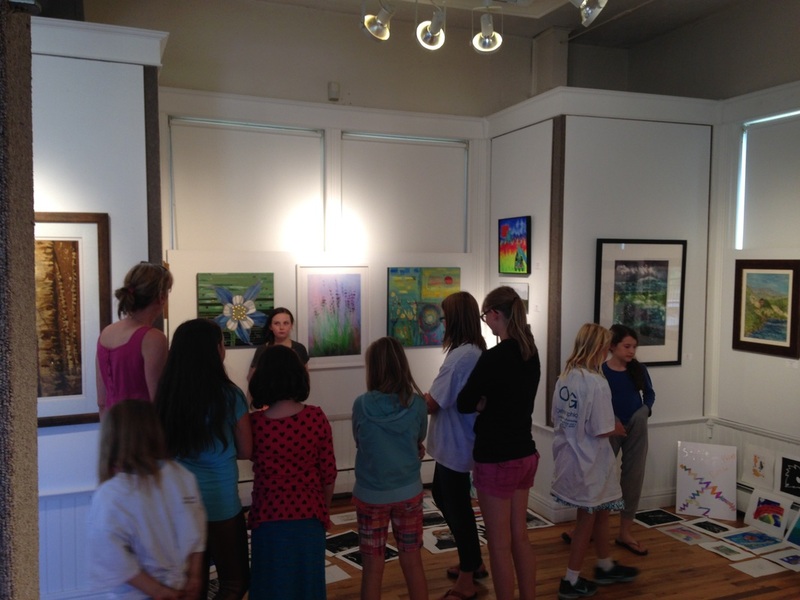 The campers also saw the gallery at Oehme Graphics, where Sue showed them some of the artists' prints that were created at Oehme Graphics. 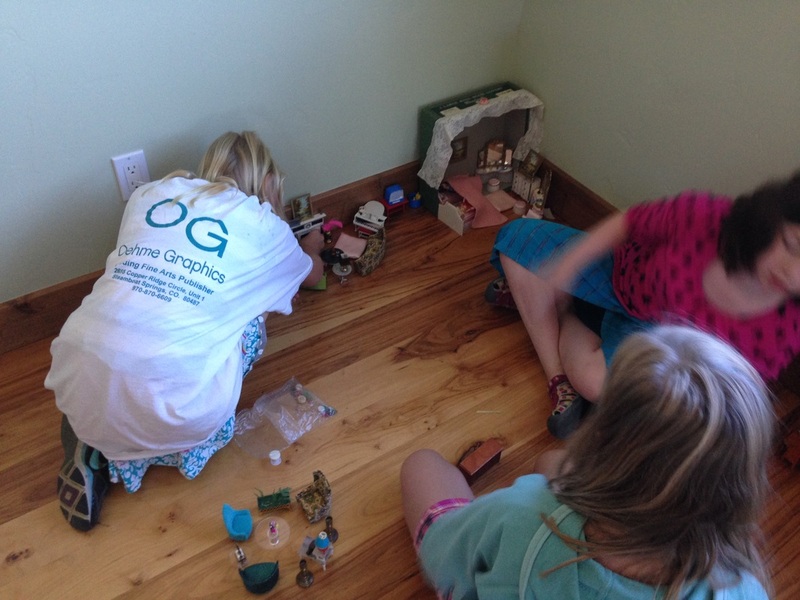 Sue also let the campers play with a doll house that had been passed down through her family. 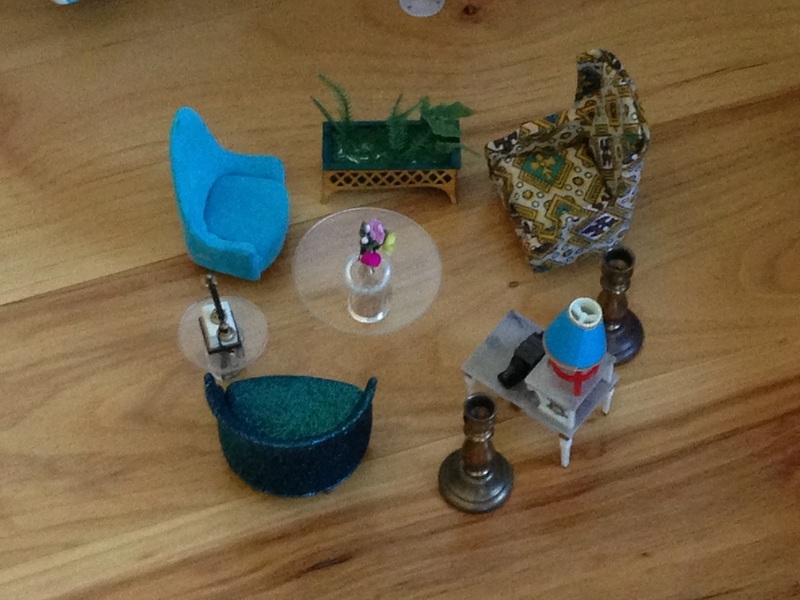 They were very creative in designing miniature rooms! 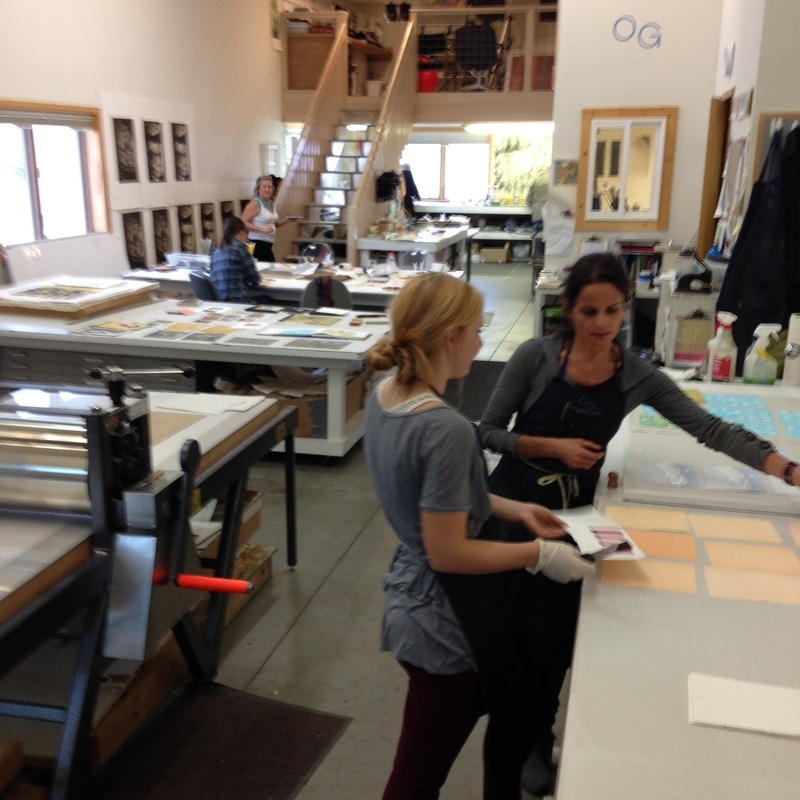 After the trip to OG, we all returned to the Depot where we printed up a storm. 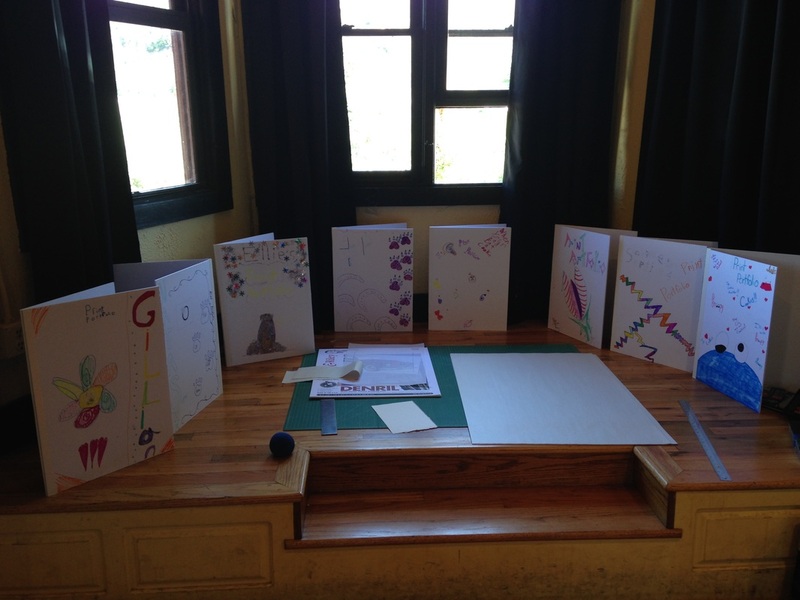 While the etchings were being printed, the campers decorated their own portfolios for storing their prints and prepared for a final critique. 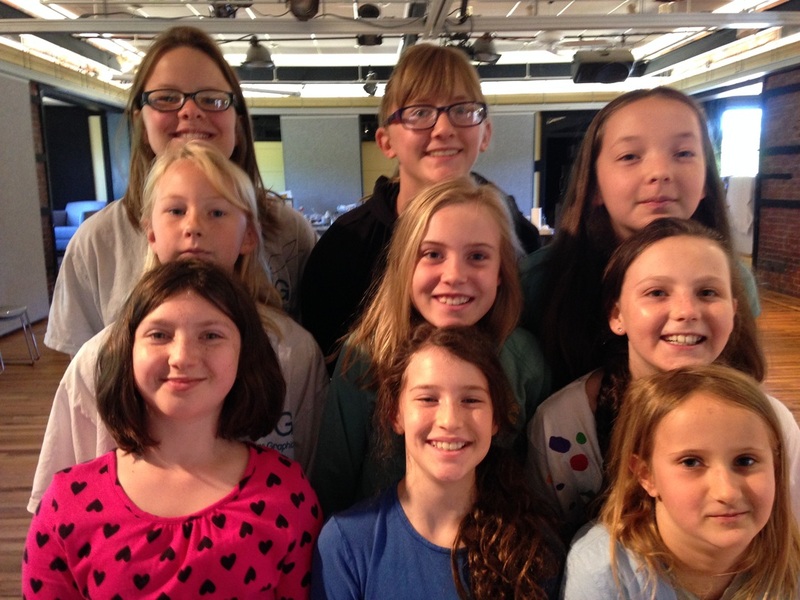 The week culminated in a discussion of the work accomplished throughout the week and a pizza party. We were able to create so much in just a week's time! 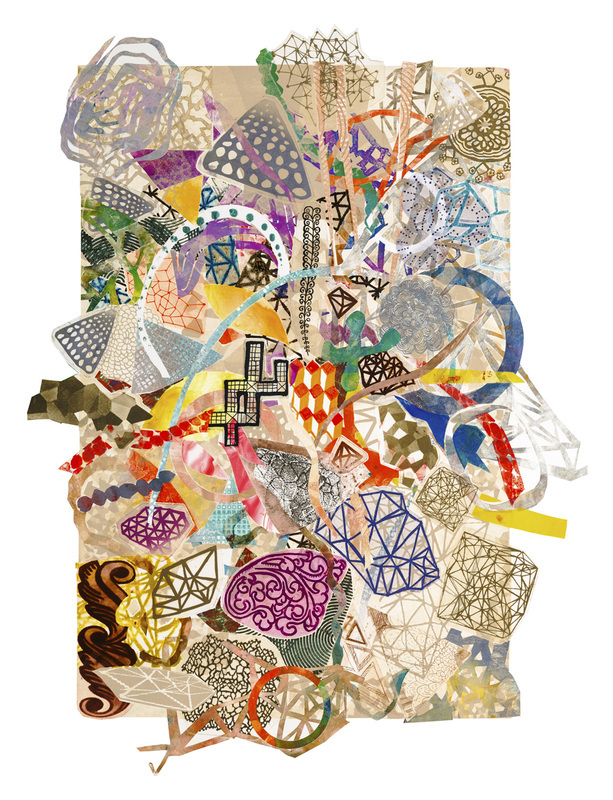 The Meta Mixaphors series is comprised of 12 prints: ten vertical prints are sized at 25 x 19 inches and two horizontal pieces are 25 x 45 inches and 25 x 44 inches. The vertical prints are priced at $1800 unframed and the horizontal prints are $3600. 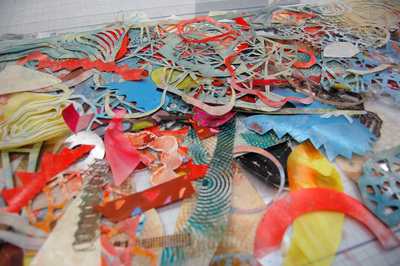 Mixed media materials used in the printing include solar and copper etchings, watercolor, silkscreen, and oil stencils. 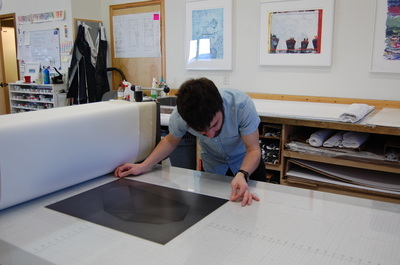 The prints are cut with an irregular "bleed" (image goes to the edge) border so that delicate details lead the viewer's eye into the complex compositions. Diane Cionni reveals the first layer of The Slippery Slope of Being Buoyant, which builds in value and density. Upon first glance, the viewer feels intimately involved with this series of prints. 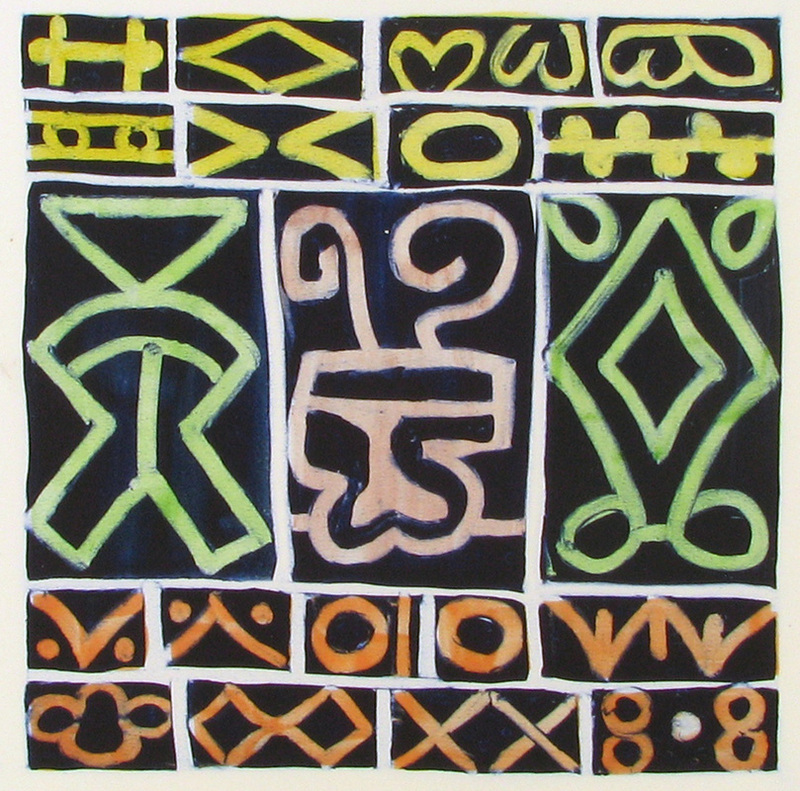 The elements in the prints appear as if they can be picked off the paper and kept as souvenirs. 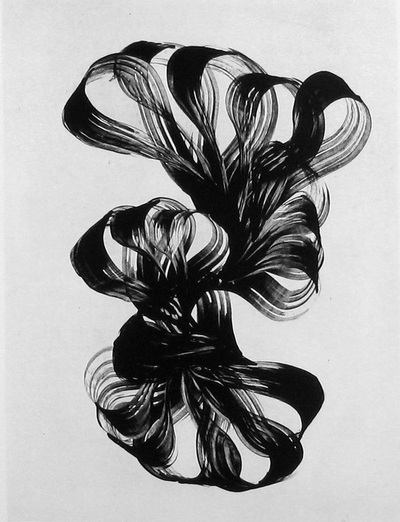 With time, the viewer realizes that the intertwined colors and shapes are "one continuous surface". They overlap, nestle with, and repel one another, resulting in compositions filled with quiet tensions and energetic density. We find ourselves wondering how the print was made, pondering the immensity of the artist's imagination, and delighting in discovering new elements. How were these prints made? 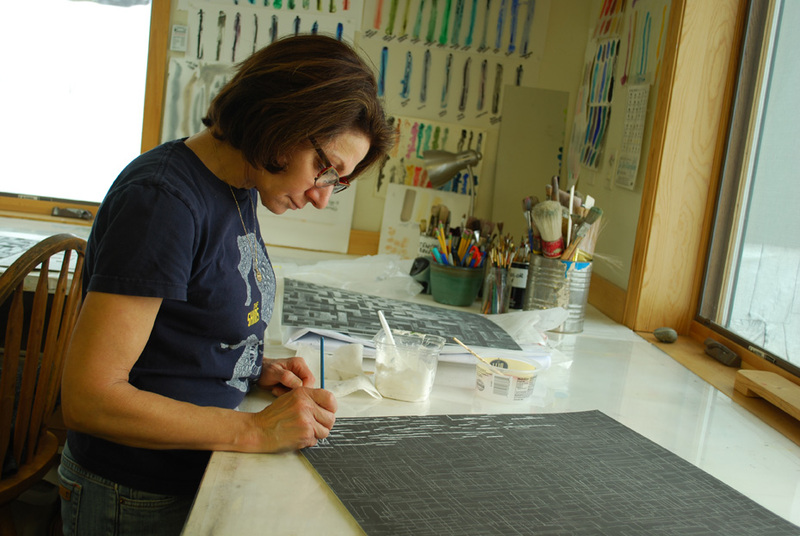 Diane Cionni is a painter working across the mediums of drawing, printmaking, and design. 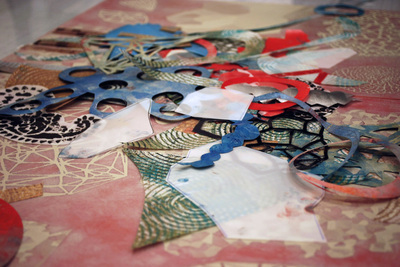 She collects endless patterns, shapes, and forms inspired by nature as resources. 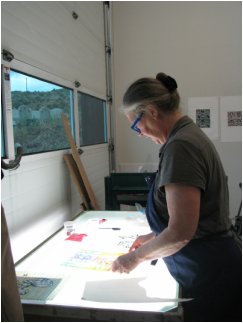 By collaborating with Master Printer, Sue Oehme, Diane integrates her elements and drawings into a broad spectrum of printmaking processes. 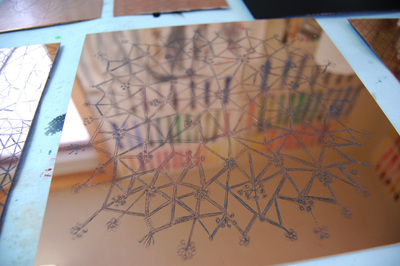 Together and separately, Diane and Sue created more than 150 various sized solar and copper plates in addition to hundreds of vellums, inked with watercolors or oil based inks. 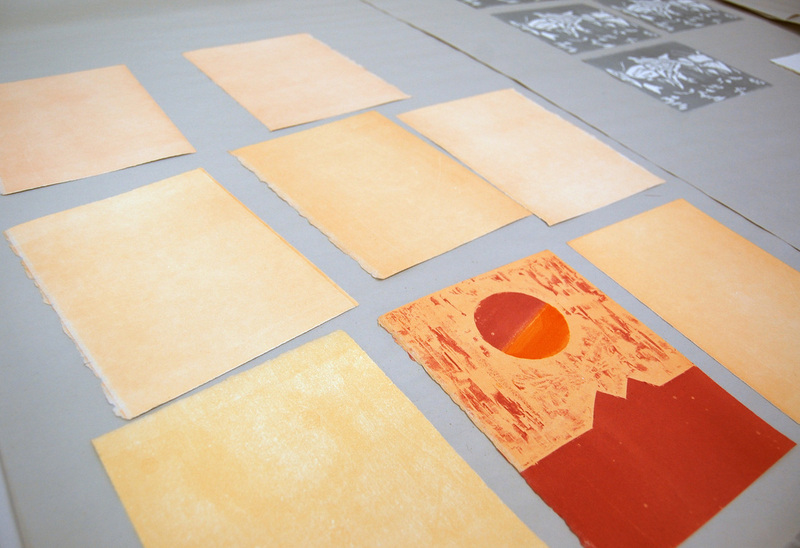 The monoprints were composed on the press bed, balancing intensive problem-solving and intuitive decision-making. 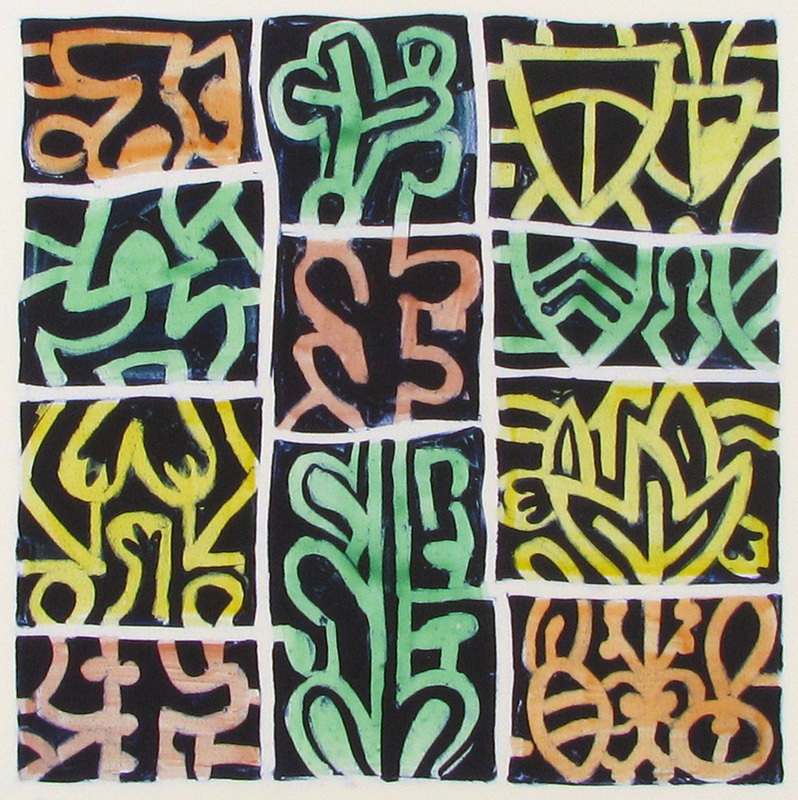 "Each monoprint is a product of piles of interlaced inked stencils, etching plates and other assorted overlapping, puzzle-like components laid in layers upon the surface of the paper". After almost an hour of arranging elements, running the print through the press is a climatic event, building excitement for the final pull. 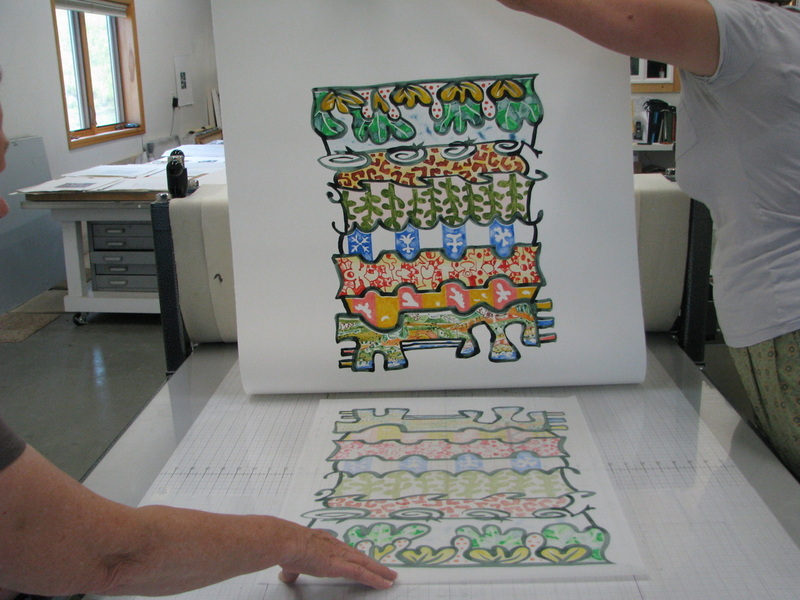 At last, the print is resolved when Sue and Diane pull hundreds of vellum elements off the paper to reveal thoughtful color relationships, intertwined patterns, balanced compositional design. 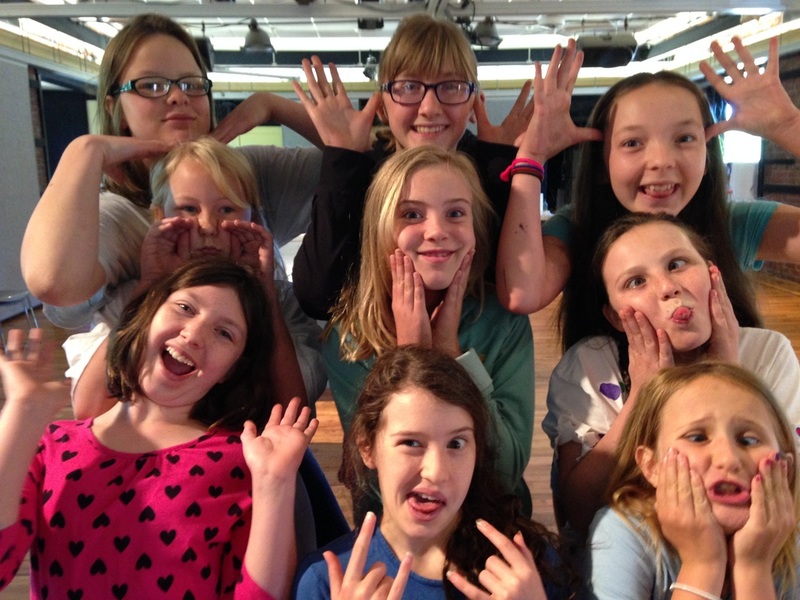 Diane and Sue's teamwork fill the studio with youthful play, innovative inspiration, and lots of laughter. 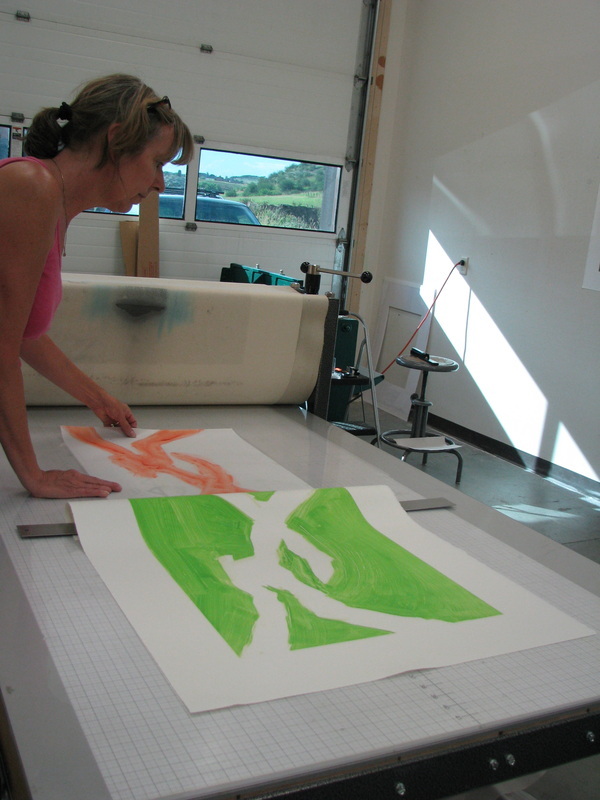 The exciting nature of Diane's process in the Meta Mixaphors series, makes hours in the print shop fly by. Diane chose to preserve the rectangular composition, yet invite leading elemental lines to hang off the rectangle. Print assistants, Hollis Moore and Teddy Benson used Exacto knives to carefully cut around small elements that poke out of the original border. The prints will be presented framed, floated against a soft white museum board. A handful of the Meta Mixaphors series, in combination with paintings and installation will be Diane's contribution to SPACE Gallery's Nature's Line's exhibition, which runs June 18-July 25 in Denver's Santa Fe Arts District.The artist reception is Thursday, June 18th from 5-8 pm. Nature's Line includes work by John Wood, Karen Sharer, Ian Mclaughlin, Taiko Chandler, Carlene Frances, Miguel Edwards, and Laura Wait. 16" x 29 1/2" and priced at $1,600. Some of the prints were exhibited at the Capital Art Fair in DC, March 21-22, and at the Boston Print Fair, March 26-29, and are now in private and corporate collections. Mazes covered the studio during Cathy's residency. 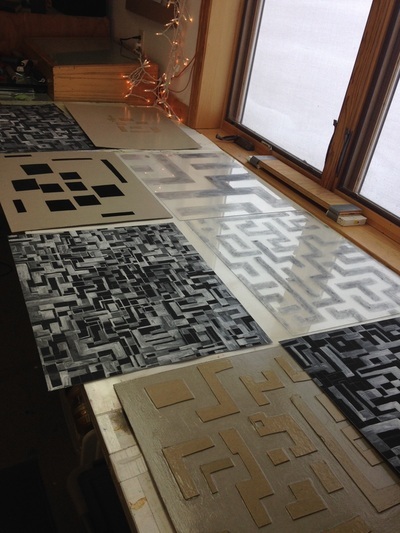 She created several plates with imagery of grid-like structures in order to layer them as complex matrixes. Subtle variation in texture and line stem from Cathy's integration of a number of plate-making techniques. She produced 12 silk aquatint, cardboard collagraph, carborundum, hard ground and soft ground copper etchings, and spit bite plates, all of which may be inked in intaglio, relief, selectively or covered with stencils. 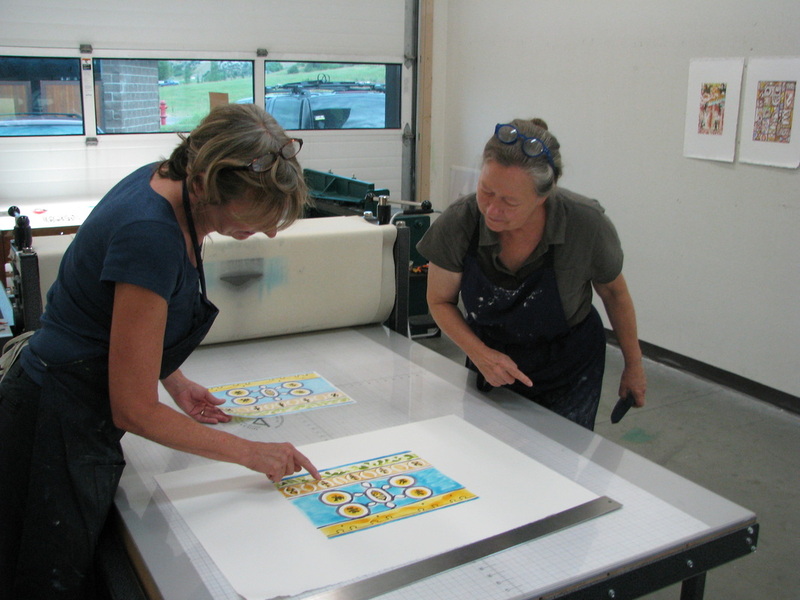 Two plate sizes define the Cathy's compositions: the large measuring 18" x 22" and the small measuring 8" x 8"
The large collection of plates allowed for play when Sue and Cathy began printing. They mixed and matched the plates as they contemplated their next moves. 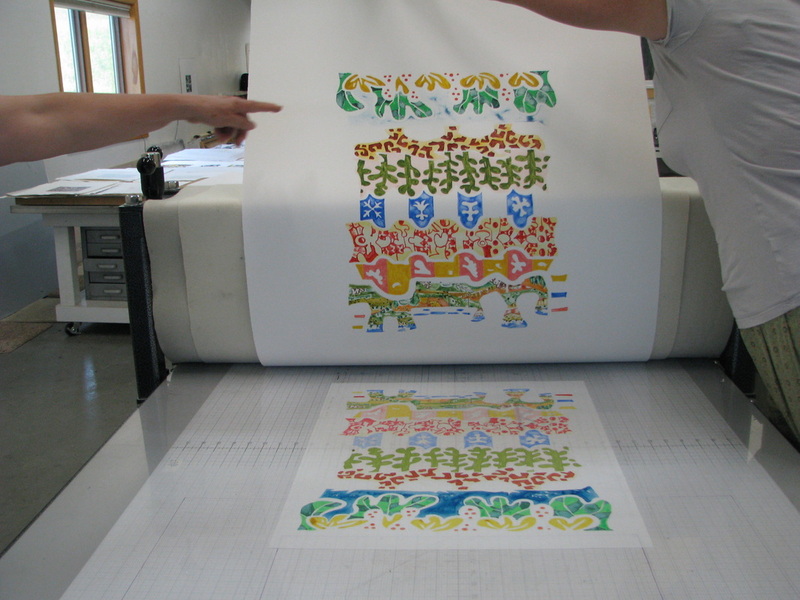 Consequently, many runs through the press layer each print. Color builds in layers of transparency and opacity; revealing a broad range of subtle colors. The color palette jumps from quiet and soft to bright and powerful and exposes a juxtaposition of warm and cool tones. Sue fans the acid room as Cathy prepares a spit bite etching on a copper plate. 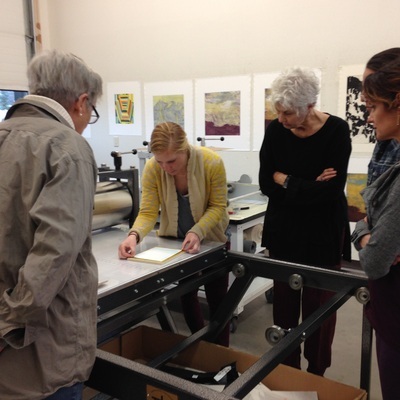 For our third Studio Sunday Hollis Moore and Sue Oehme co-taught reductive woodcut printmaking. Five lovely artists created a small editions of colorful relief prints. Working on a 6" x 8" blocks of birch wood the artists carved and printed at least two layers of color. The artists dedicated an impressive amount of time and thought into the workshop in order to achieve a multi-layerd print. 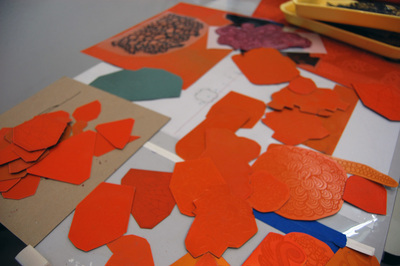 Some participants even explored techniques such as stencils, monotype, and block rotation in combination with their woodcuts. 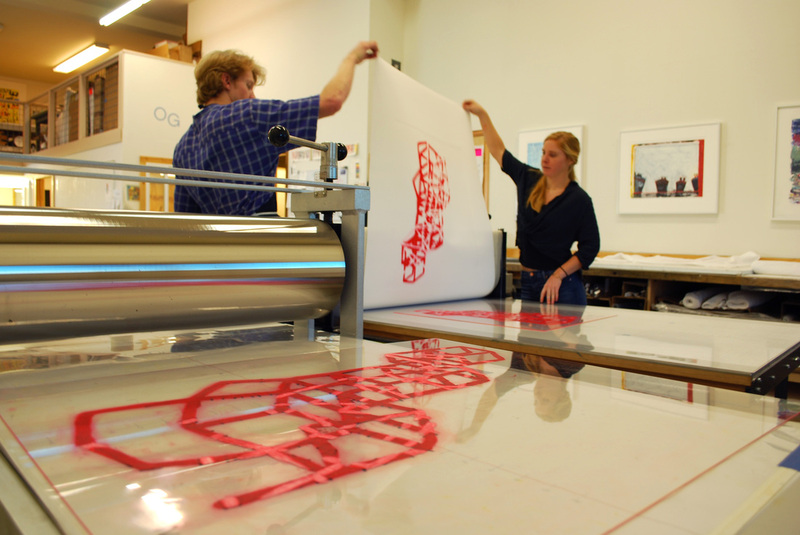 Studio Sundays are an ongoing, monthly studio practice in Oehme Graphics' state of the art printmaking facility. 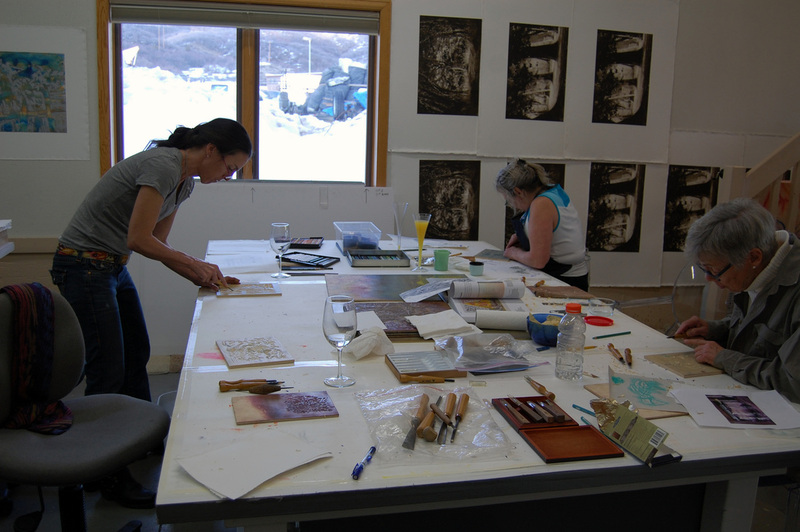 For each workshop Master Printer, Sue Oehme will introduce a different printmaking technique. 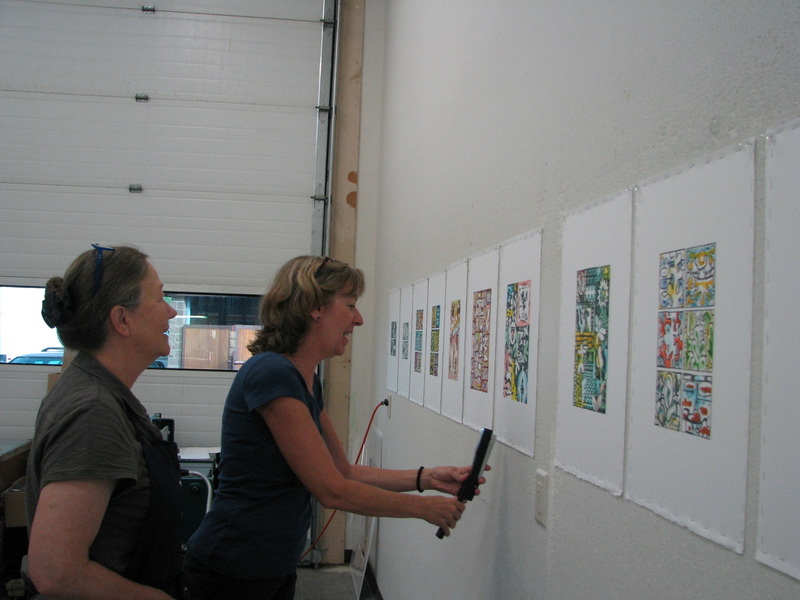 Participants are encouraged to practice this technique alongside the camaraderie of other artists. Independent work is also welcome. Our intention is to establish a creative environment for participants to learn new techniques that may be incorporated into their work. Some printmaking experience is preferred. Listed below are our upcoming Studio Sundays. 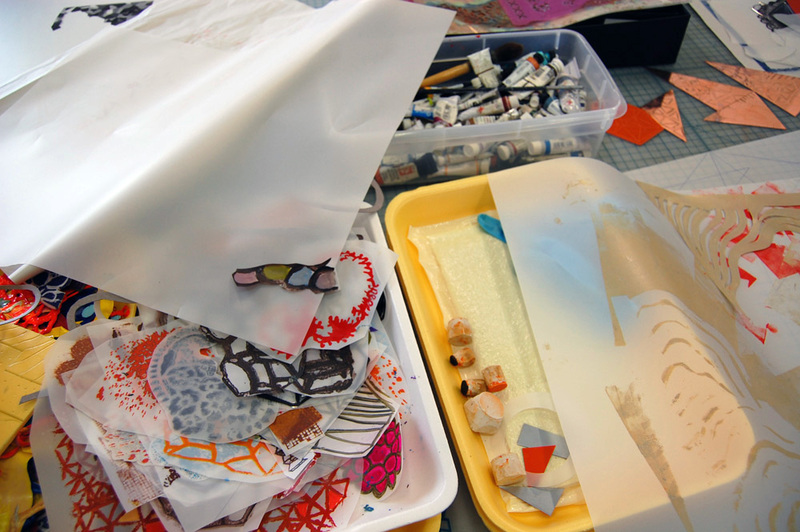 Space is limited to six artists with one instructor or eight with two instructors. Cost is $100 per day and hours are from 10 am- 4 pm. Participants will rotate on the two presses. Participants may purchase materials or bring their own. Call Oehme Graphics at (970) 870-6609 to reserve your spot at any of our Studio Sundays. 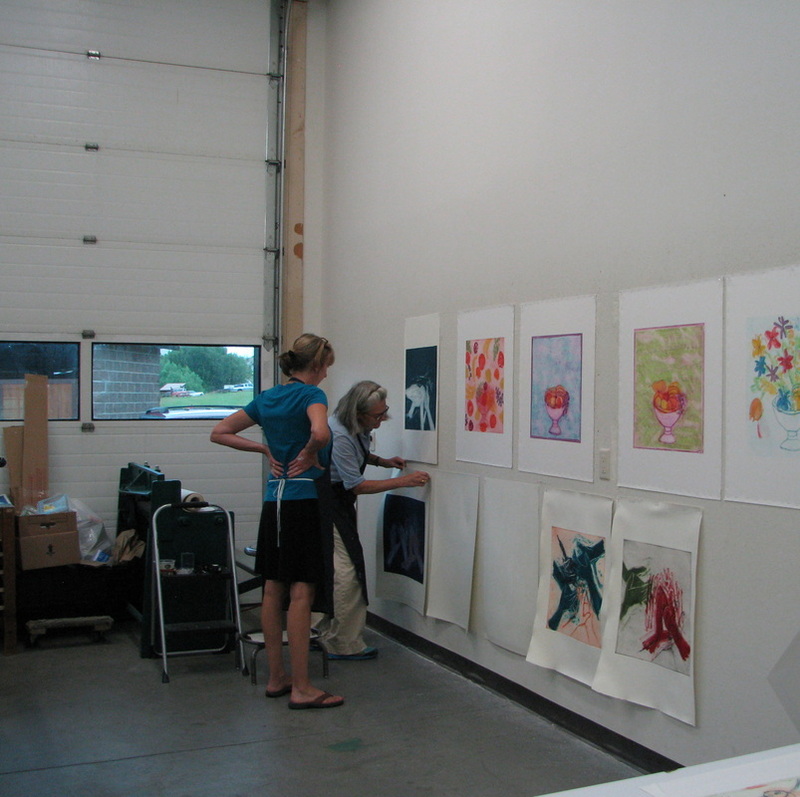 Above (L to R) are Mary, Candice, and Jo carving away (on the wall behind the artists are sideways Gloria Pererya editions drying). Below are the prints at various points in the woodcut process. New layers change the prints quickly by adding another color and more imagery. The entire edition in run through the press with each new layer because by the end of the process the entire woodblock will be carved away! 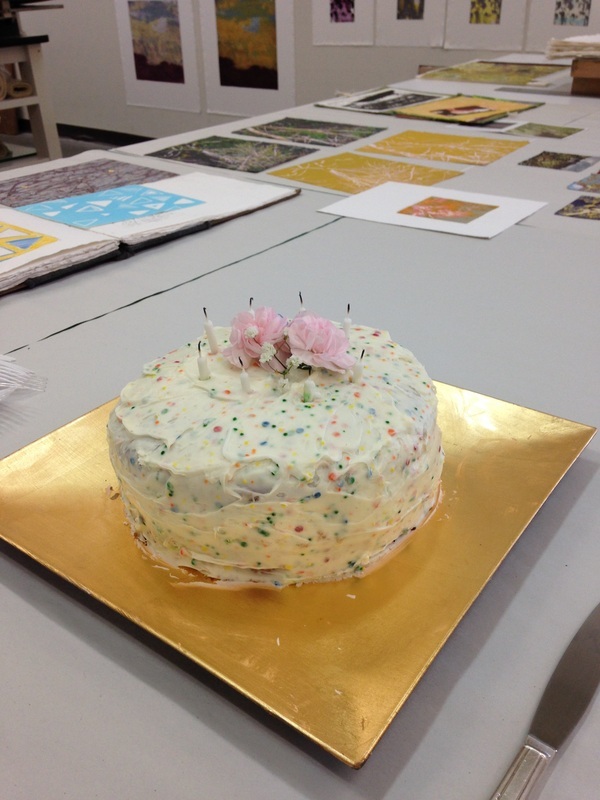 Sue's funfetti, sparkle cake gave us the sugar kick we needed at the end of the workshop. Happy Birthday Sue! We loved celebrating with wonderful company and colorful prints! 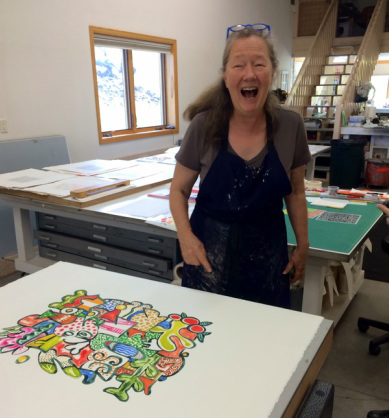 Deborah Freedman, a NYC painter and printmaker, collaborated with Sue Oehme to publish her third series of prints at Oehme Graphics in January 2015. 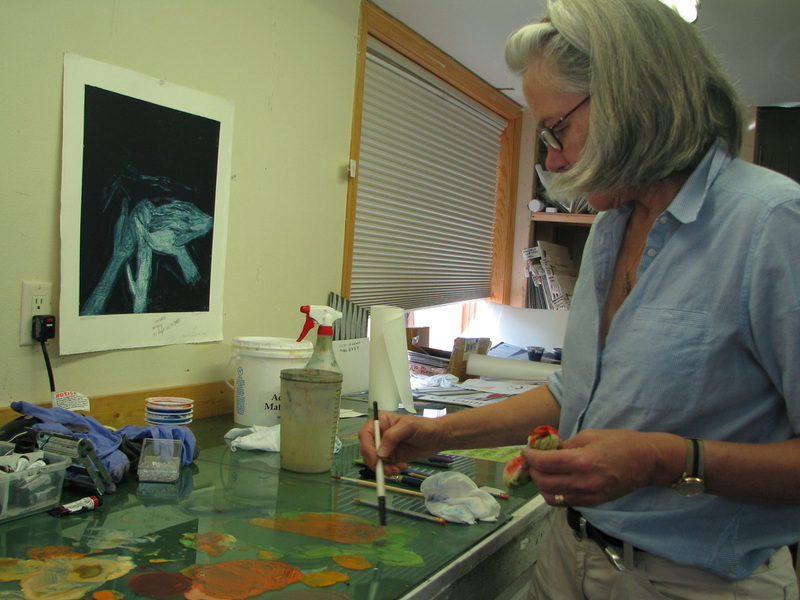 Deborah's painterly sensibility translates beautifully into watercolor monotypes to create atmospheric landscape prints. This was her first winter visit to our beautiful mountain town, and the whiteness of our snow was an influence on her. During her week at Oehme Graphics, Deborah Freedman expanded upon two former series, Imagined Possibilities and With or Without You, to create a new body of work entitled Every Breaking Wave. She made 22 variously sized horizontal landscapes in order to reference what Deborah says her work has always been about: water. Deborah picked right where she left off last time she visited Oehme Graphics in June. 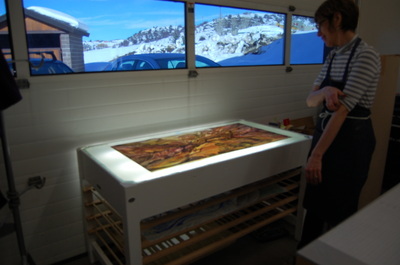 She works from a key plate, a drawing of a landscape with a horizon line, as she paints to suggest immense sky and land. 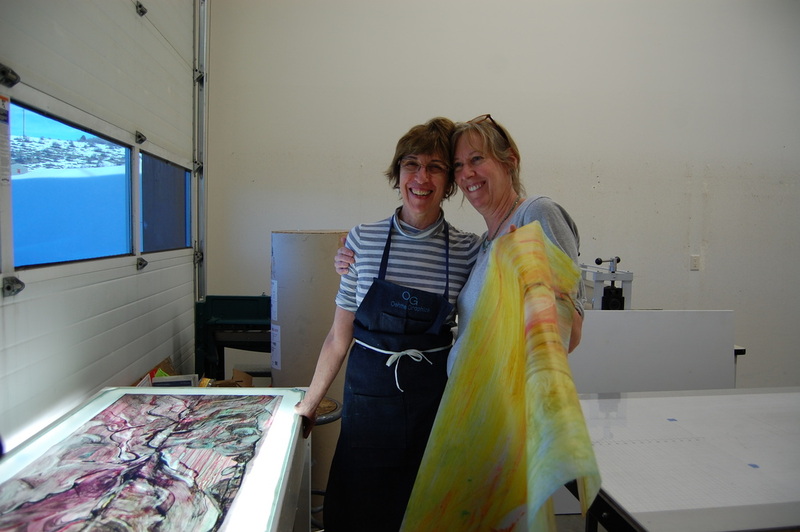 Deborah will paint multiple vellums for a few hours before printing with Master Printer Sue Oehme. 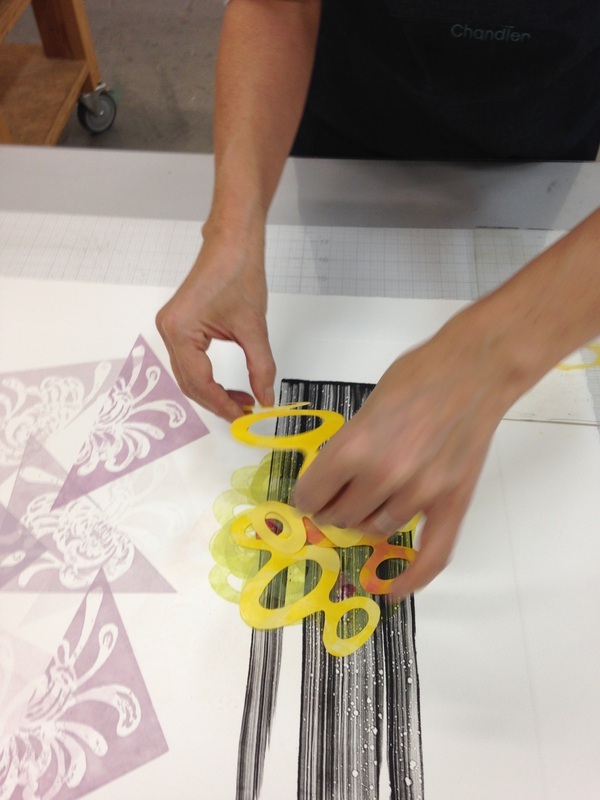 Sue proposes possibilities for rotation of vellums, hand printing, and plate sequence. Deborah says " I feel 'Sue and I' got to another level of collaboration and I got to a more confident place with the vellum, watercolors, and ghosts. Good to be friends with ghosts!" 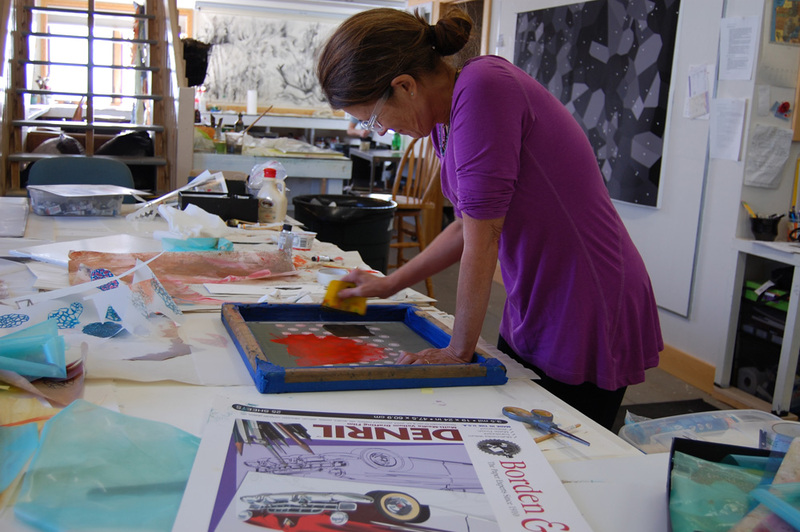 Deborah's playful approach to printmaking and good humor brought joy to the studio. We celebrated her project over dinner with local artists Diane Cionni, David Schaller, and Tibby Spear, as well as with a visit from Colorado Mountain College's art appreciation students. The smallest prints, measuring 18 1/2 x 26 inches and priced at $1,100, capture cosmic, luminescent qualities of color, texture and line. Three medium-sized prints, measuring 19 1/2 x 40 inches or 28 1/2 x 40 1/2 inches, gesturally invite the viewer into a romantic world of bright blues, muted pinks, and imagined greens. 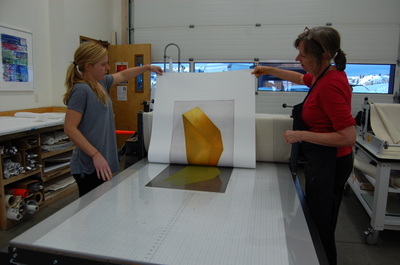 Sue printing a vellum inked in white and Deborah considering her print on the light table. As Deborah increases the scale of the images (30 1/2 x 52 inches), her pieces display a narrative about her immersive involvement in each watercolor vellum. 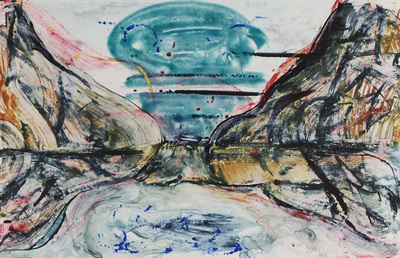 The history of Deborah's marks, which she made with various paint brushes, ink spreaders, rollers, and spray bottles, along with the use of ghost vellums, pull the images together into completed, multi-layered landscapes. Priced at $2,900, these 12 large Every Breaking Wave prints demonstrate how a successful collaboration between an artist and master printer results in the unification of exploration and engaged sensibility. This winter the Oehme Graphics staff has been editioning our largest prints by artists Diana Cooper, Jason Karolak, Melissa Meyer, and David Row. 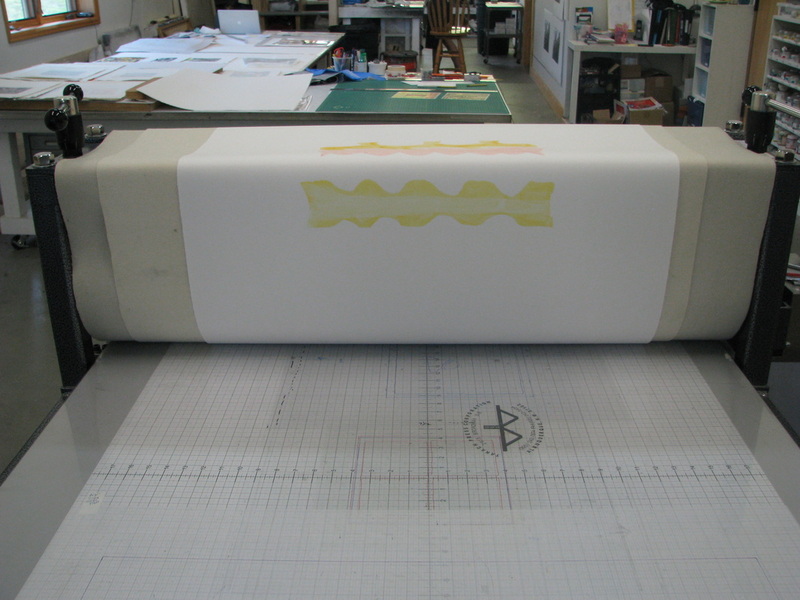 Some prints take as long as three hours to produce with four printers while others barely fit on the press bed! It is quite a joy to fill the print shop with colorful pieces that contrast with the snowy, winter landscape outside our windows. 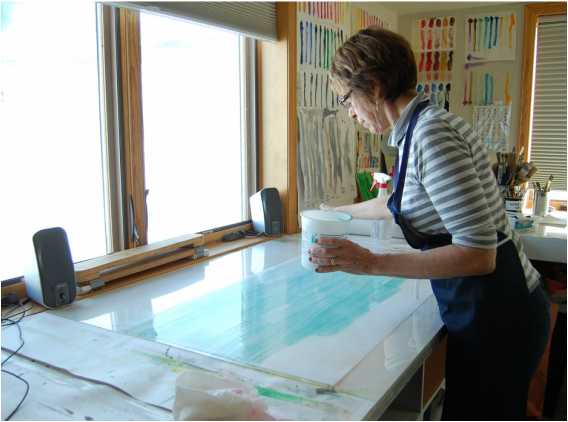 We are delighted with the current artist in residence, Deborah Freedman, and her generously colored large watercolor monotypes. Sneak peek of her project at the bottom of the post. 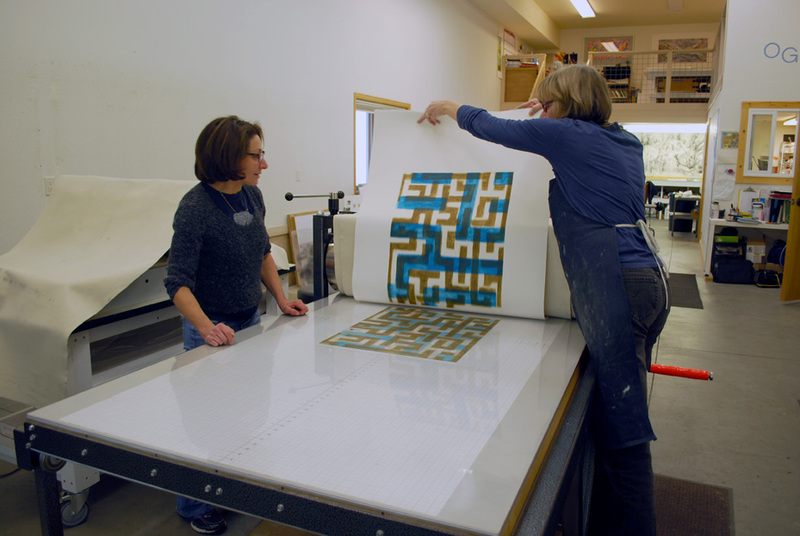 Master Printer, Sue Oehme, is registering Jason Karolak's PR-1320. 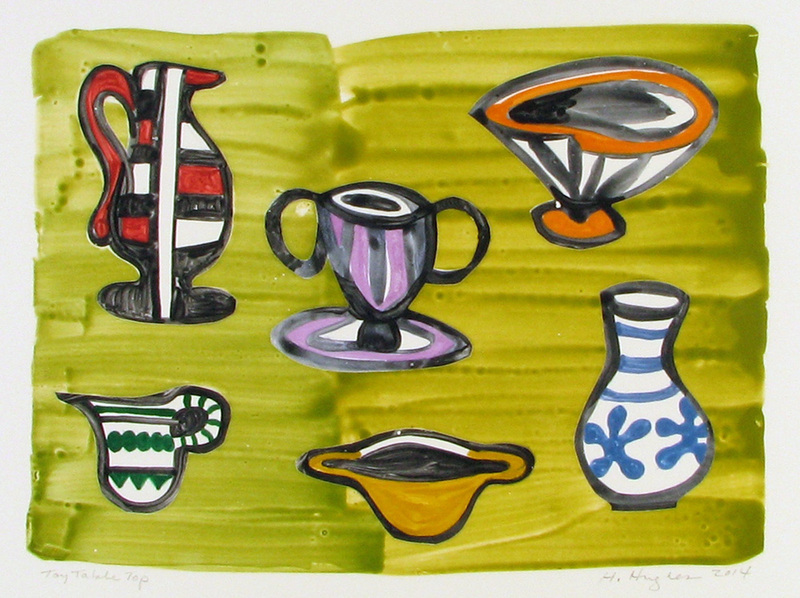 Four carborundum plates construct the red form on this print. The last plate is a steel-faced, step-etched copper aquatint and will fill in the negative space and tone the form with beautiful, velvety black ink. 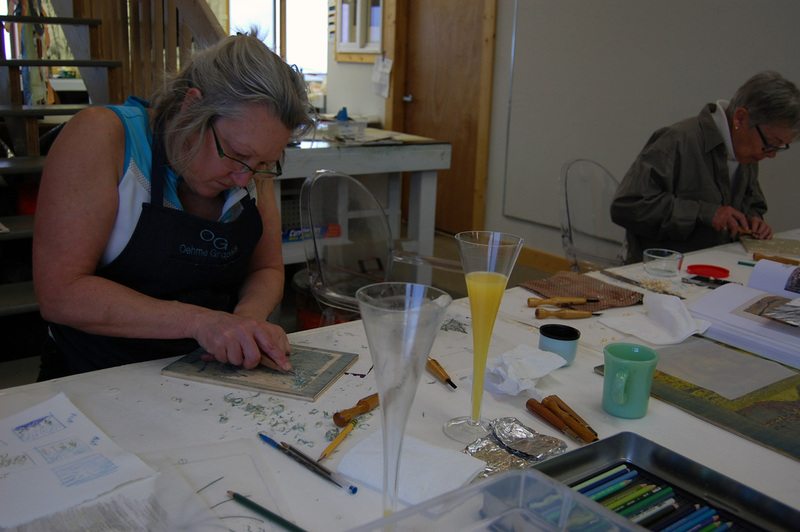 Top left: Hollis and Sue print the second of three plate in David Row's Lightrap Yellow. Top Right: Our wonderful, current intern Teddy registers the first plate for Lightrap Yellow Bottom Left: Sue and Hollis print two of eight plates in a solar plate etching monoprint for Melissa Meyer's The Chief series.Bottom Right: Malcolm and Hollis printing Jason Karolak's PR-1320. Our current artist in residence, Deborah Freedman, traveled from NYC for her third visit to Oehme Graphics. 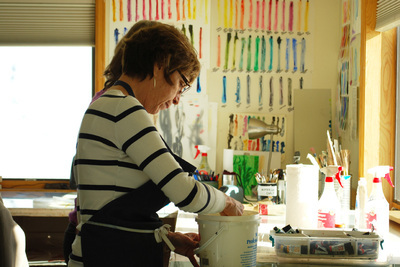 She brightens the print shop with her colorful watercolor monoprints. 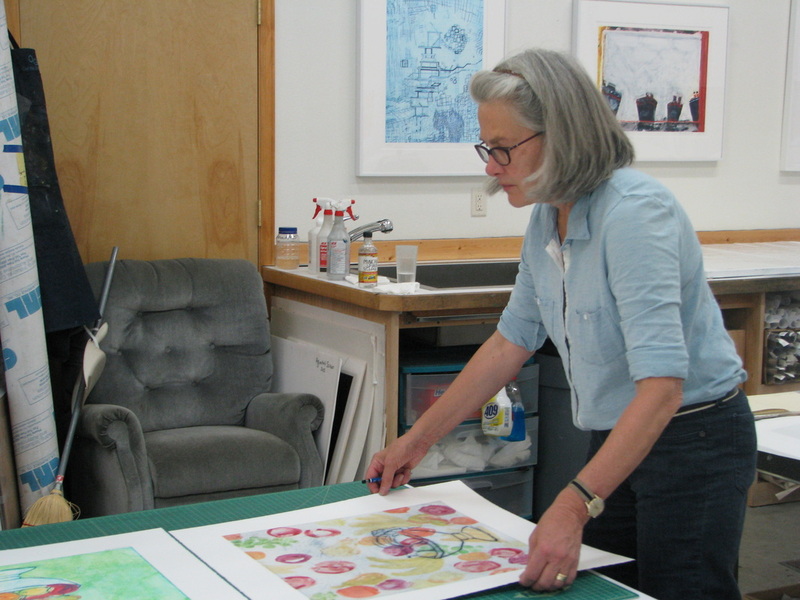 We look forward to Deborah completing her third series of prints in collaboration with Master Printer Sue Oehme. To see Deborah's previous work at OG click here. 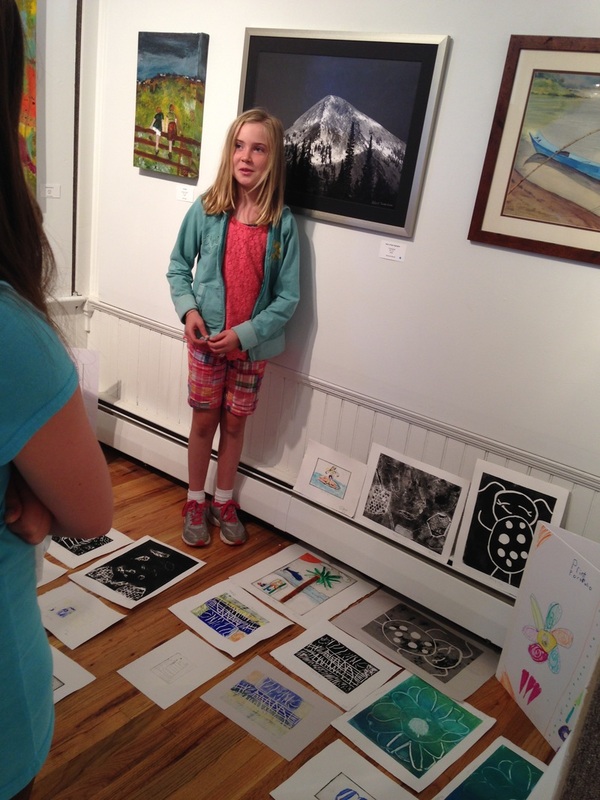 Her new prints will be available through Oehme Graphics on Feb. 6. Denver based artist, Taiko Chandler, spent a week in mid-September at Oehme Graphics working with Sue on monoprints and solar plate etchings. Taiko was born and raised in Nagano, Japan, and having left in 1998, she went on to live in the varied cities of Sheffield in the UK, Miami, Austin, and now Denver. 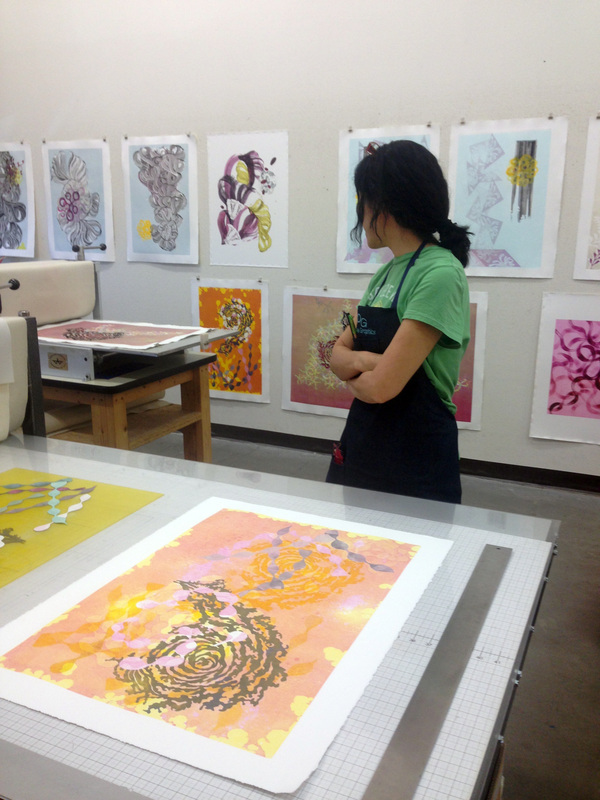 Originally trained as a nurse, Taiko has always been interested in arts, but it was her venture into printmaking that has completely captured her attention. The artist’s work reflects her observations of the world with particular interest paid to patterns found in nature. 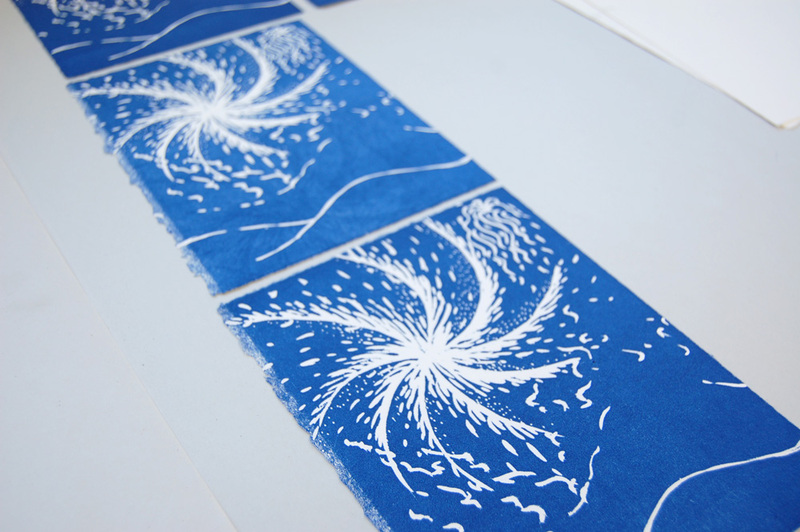 It is through the use of repeated elements common in printmaking that Taiko aims to bring to light the oppositional elements of creation and erosion caused by natural forces. 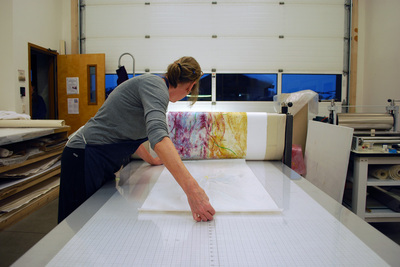 When Taiko arrived in Steamboat Springs, she laid out the numerous unfinished monotypes that she was currently working on. 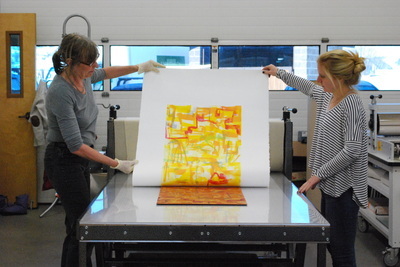 She and Sue sorted through the thirty plus prints, pulling out the pieces that seemed to be asking for further development. 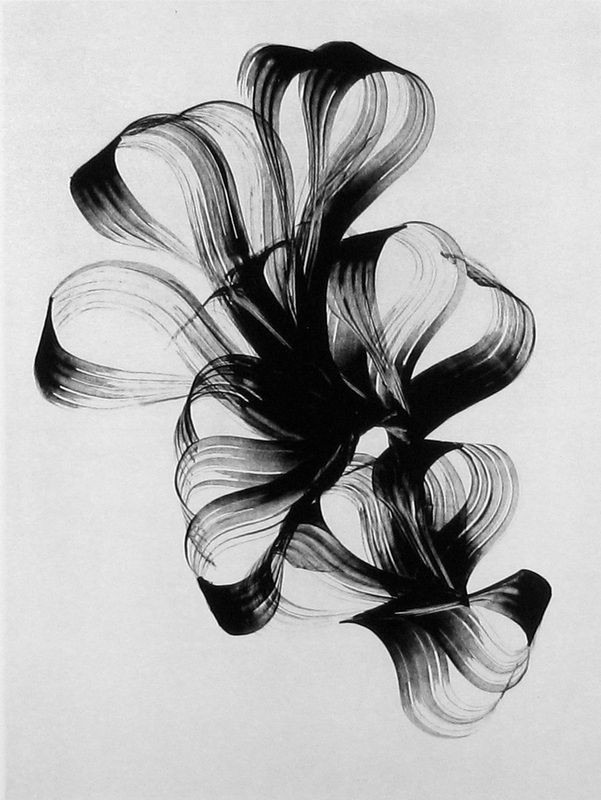 With Sue’s vast knowledge of monotype techniques, the master printer presented a variety of technical options that Taiko could steer her image making towards. 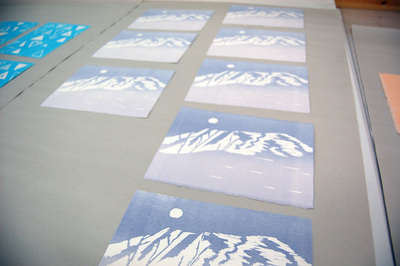 Thus began the collaboration between artist and printer with Taiko making new stencils, collographs, and drawn films and Sue prepping all components of the printing process from inking up plates and stencils to soaking the already printed upon paper. For the remainder of the week Taiko and Sue worked in tandem, and this back and forth granted Taiko the freedom to make swift and sure decisions while also keeping things loose and allowing for a sense of playful development. Taiko’s time spent at Oehme Graphics was highlighted by this exploration and mining of her already existing body of work. 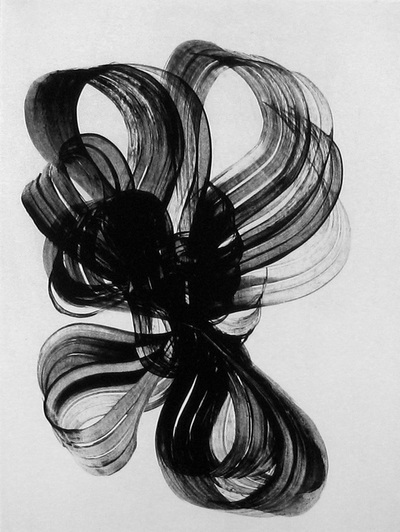 The resulting ten monotypes and three solar plate editions are evidence of the Taiko’s ability to stretch her imagery while maintaining her creative vision. 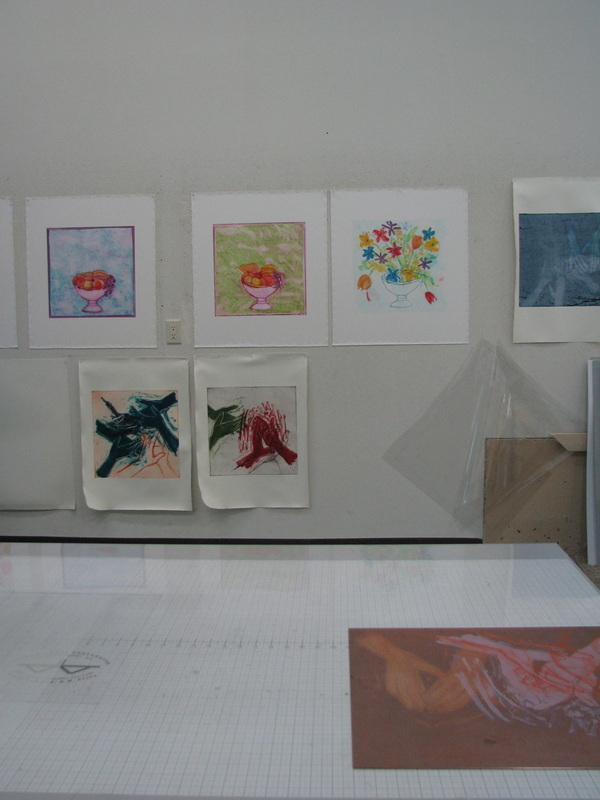 The monotypes are 30" x 22" priced at $650. 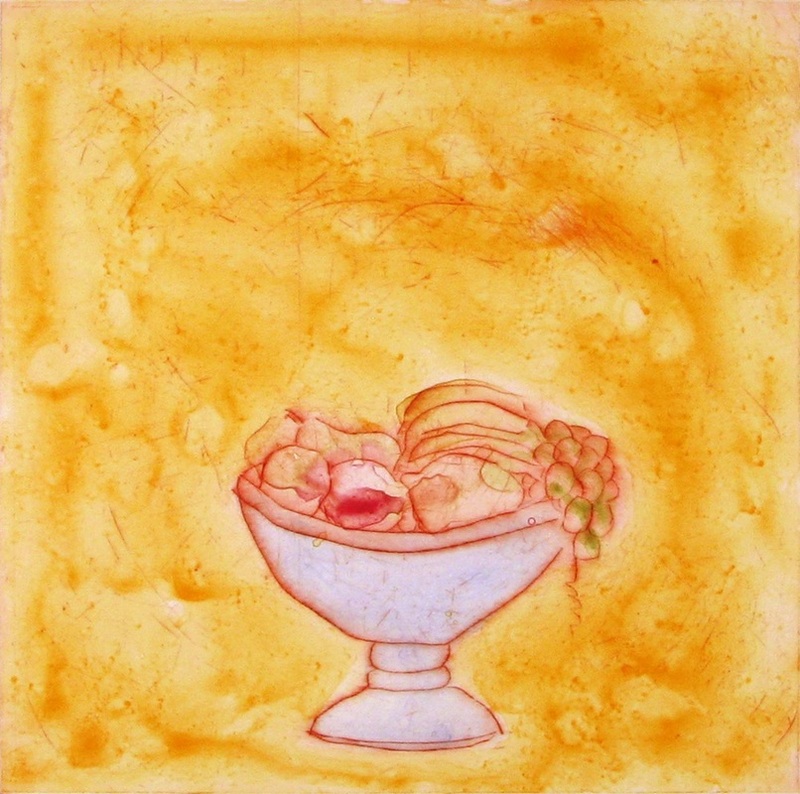 The solar plates etchings are 22 1/2" x 18" priced at $400 in black and white and $600 for the three plate color print. Oehme Graphics loved having Taiko in the studio, and OG also loved the delicious traditional Japanese meals that Taiko generously prepared – our eyes were full of beauty and our stomachs were full of scrumptious food! Sue and Taiko enjoying Taiko's creative lunch...a recipe for the books! Fertile Valley, Watercolor Monotype, 24" x 30"
Holly Hughes, a New York based painter and painting instructor, finishing a sabbatical from RISD, began her week here at Oehme Graphics with a quick tour of the studio and stroll around the town of Steamboat Springs with her husband, Bruce. 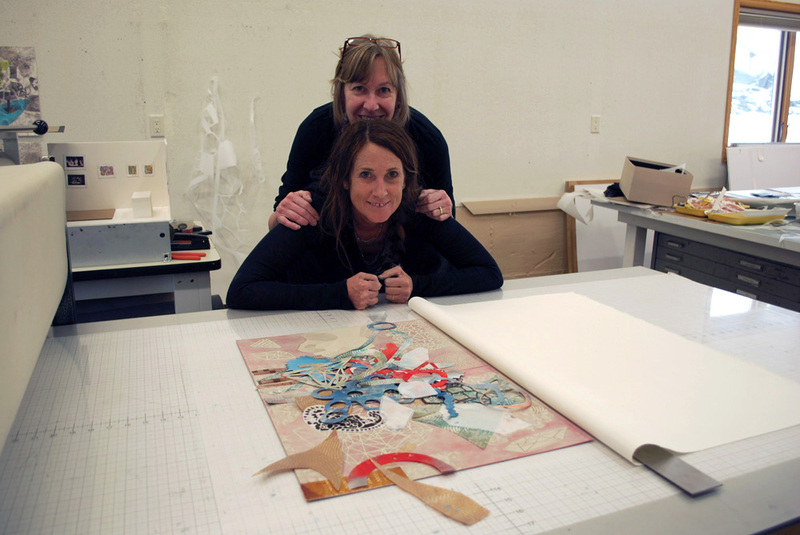 Holly and Sue have had an ongoing relationship of student and teacher; Holly has taken two of Sue's workshops, one at the Women's Workshop in New York State, and the other in Steamboat at OG in early 2012. As a tenured professor of painting at RISD, Holly has had much practice as a teacher, but this past week, she had the opportunity to be a student again! 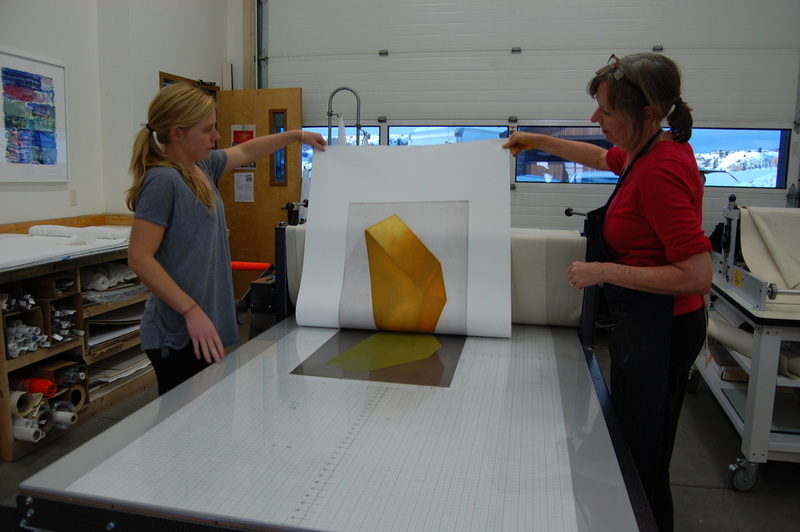 This summer, for the first time, Holly and Sue had the chance to collaborate on a print project. 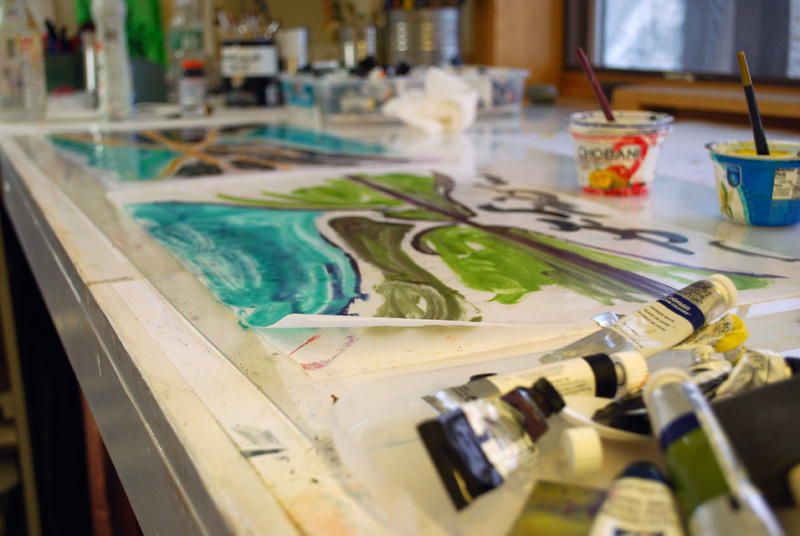 Toy Table Top, Watercolor Monotype, 13 3/4" x 16 3/4"
Holly came to OG well prepared for a prolific week. She had been developing a series of watercolor vellums, most of which were printed on her first day here. 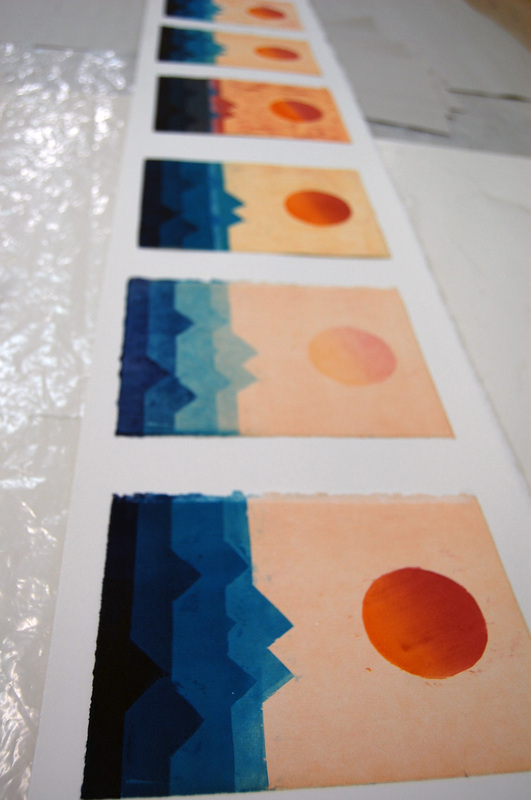 A couple of these watercolor vellums were made into solar plates. Throughout the week, Holly continued to make watercolor vellums some of which were layered with the solar plates while others stood alone. 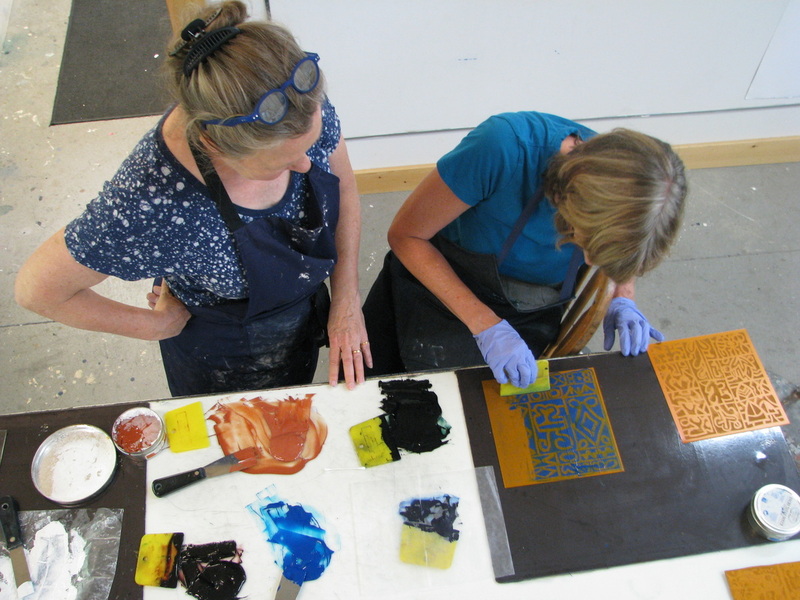 After pulling proofs Holly and Sue sat down and decided on four solar plates to edition. Woven Garden 3, Watercolor and Oil Monoprint, 13" x 12"
Woven Garden 2, Watercolor and Oil Monoprint, 13" x 12"
During this past year on sabbatical, she has spent time with her artwork, traveling around the globe, continuing her search for inspiration. 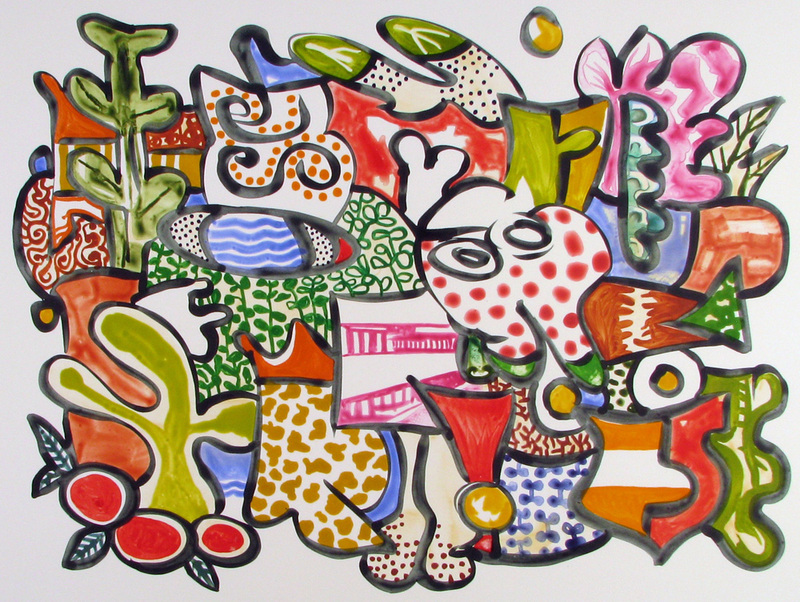 Holly is interested in ancient mythology and decorative design traditions, which take apparent shape in her pieces. She has created an elaborate abstracted symbolic vocabulary, and creates intriguing compositions compelled by an expert color palette, while other times she works directly from her interest in decorative tiles, complying imagery in a grid-like manor. Holly's week here at OG was exciting, everyday showed a wall covered in new pieces ranging from small to large, monochromatic to polychromatic. The week ended with a quick signing and a night at the local rodeo, something not to be missed in our western town of Steamboat Springs! Please visit our website to view all of Holly Hughes' work. 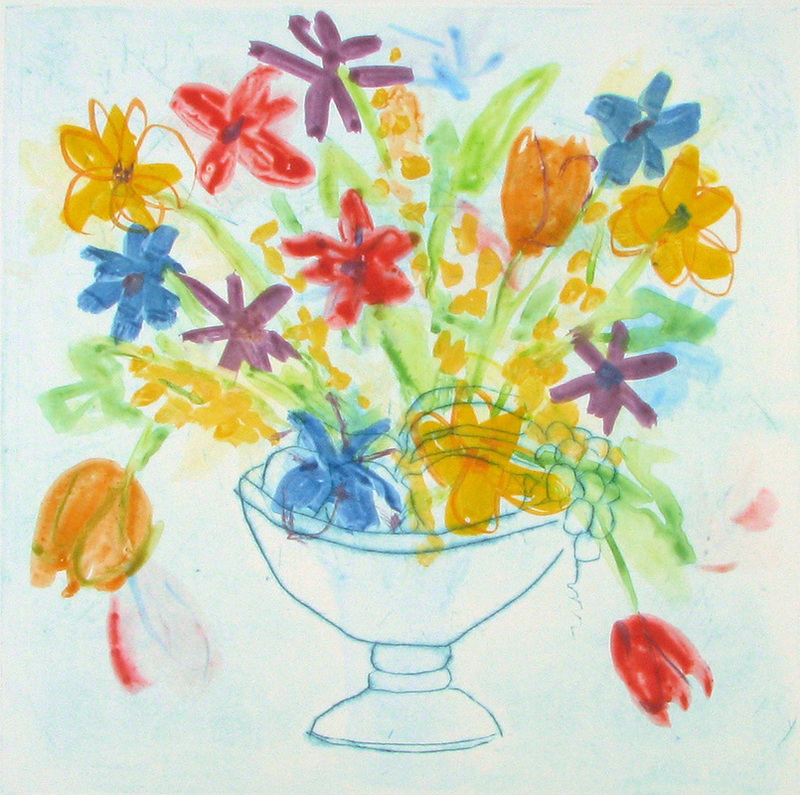 Centerpiece #4, drypoint and watercolor monoprint, 24 1/4" x 24"
Sue first met Paula Schuette Kraemer when the artist came to Steamboat Springs to share her work, which had been printed in her own studio, Open Gate Press. Her works soon found a place in the OG flat files. This quick introduction last year led to a highly anticipated week-long visit from Paula. A week that led to brightly colored flying fruit, delicately painted flowers, beautifully glowing watercolor washes, and hands playing unknown games. 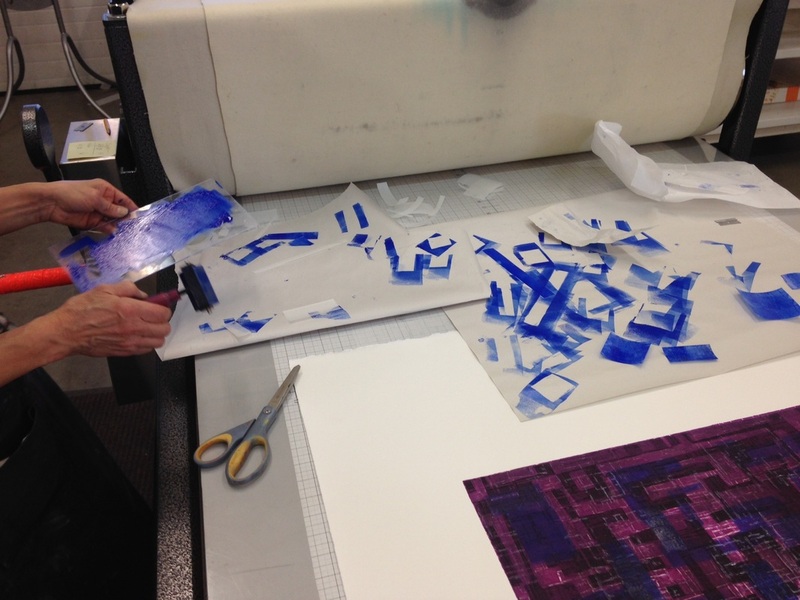 Paula came prepared with drypoint and KM photopolymer plates. Throughout the course of the week she made a carborundum plate and a silk collorgraph plate. Along with these Paula had a chance to paint countless watercolor vellums which were used as background color and context in her prints. The Name of the Game...? #2, mixed media monoprint, 24 1/4" x 28"
The Name of the Game...? 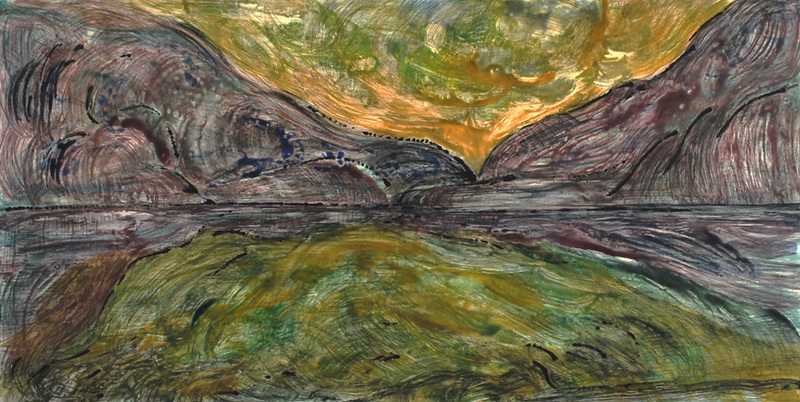 #3, mixed media monoprint, 24 1/4" x 28"
It quickly became clear that Paula's work came from a deeply sentimental place. She explained that her imagery and inspiration comes from the many stages life has to offer. She finds intrigue in the joys of life as well as the sorrows. "It is not her desire to be known for any one specific theme, but rather to use her artistic ability to portray life's experiences." 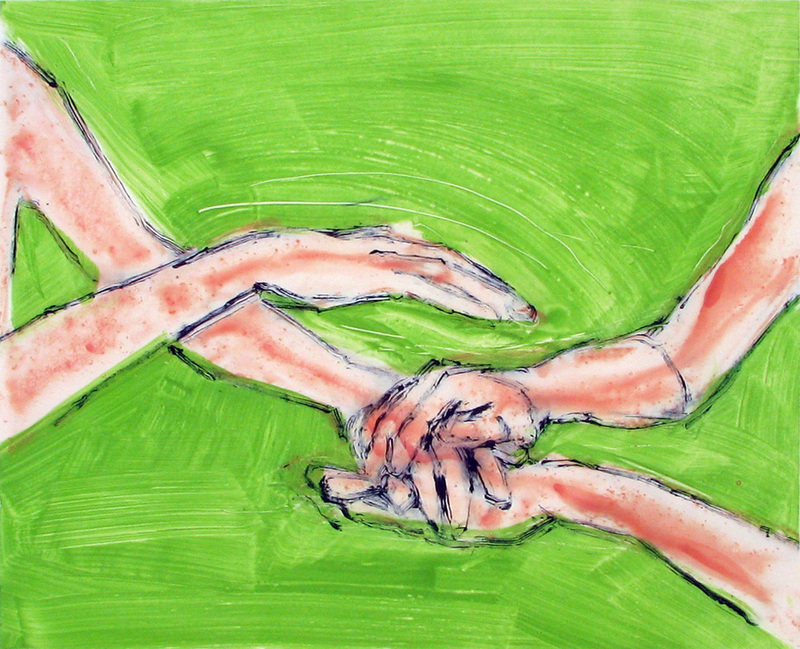 Her work weaves a narrative which evokes a peaceful remembrance and an introspective tenderness. Paula often works with symbols. 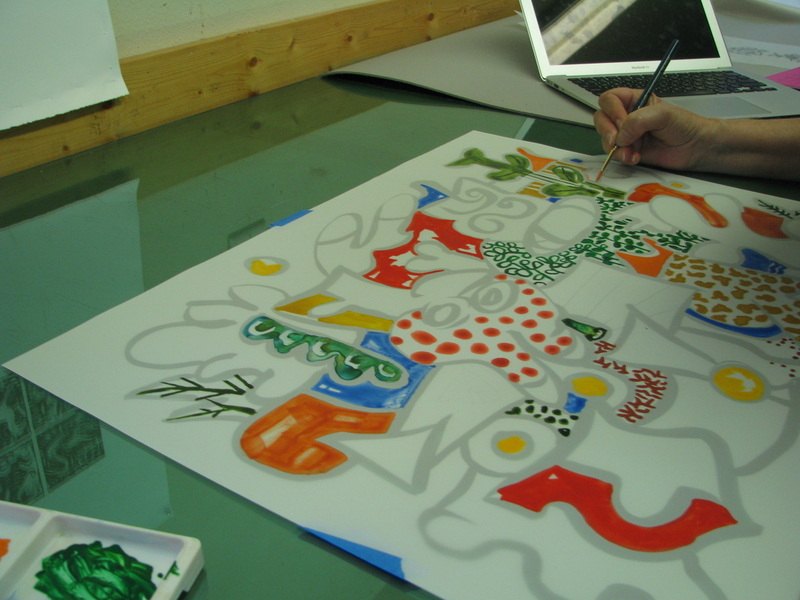 This week in the OG studio those symbols were the centerpiece and a group of hands. By the end of the week Paula had printed more than a dozen Centerpieces. Each with a different variety of fruits, flowers or text, all constructed from many layered plates. 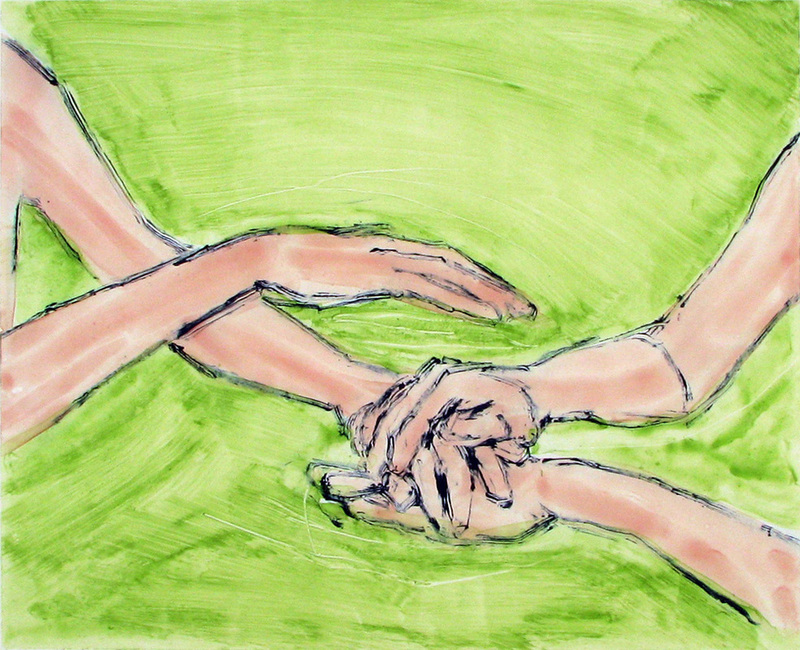 Simultaneously, Paula worked on a series of prints depicting hands, she mixed silk collograph plates with drypoint, KM, and watercolor vellums. After trying out many combinations of colors, plates, and techniques, the week came to an end. We found time to make it up to the Strawberry Park hot springs to have a relaxing soak at the end of a week cramped with colorful imagery and symbols. 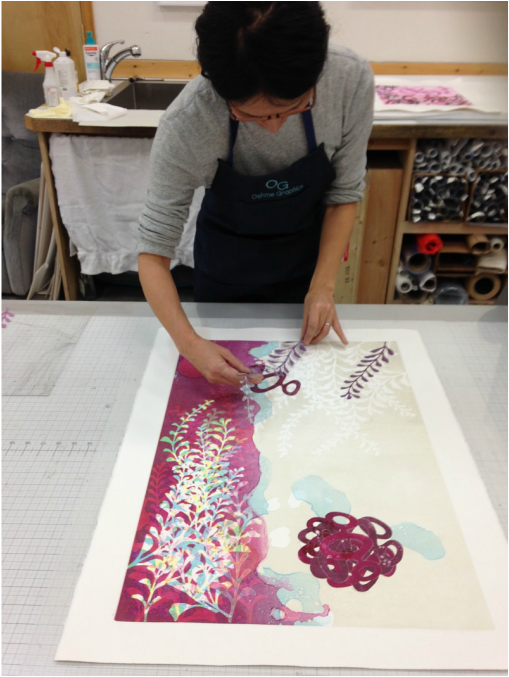 Paula left many finished prints with Oehme Graphics each priced at $600, and took some proofs home to work from. Paula's time at OG was delightfully inspired and bountifully fruitful. 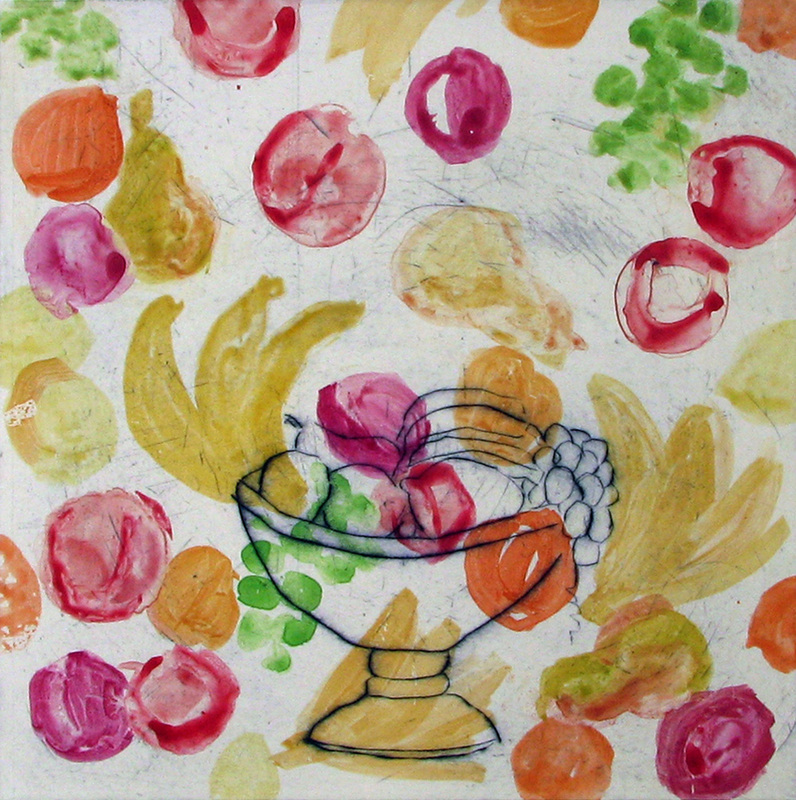 Centerpiece #7, drypoint and watercolor monoprint, 24 1/4" x 24"
Centerpiece #1, drypoint and watercolor monoprint, 24 1/4" x 24"
You can see all of Paula's work on our website.